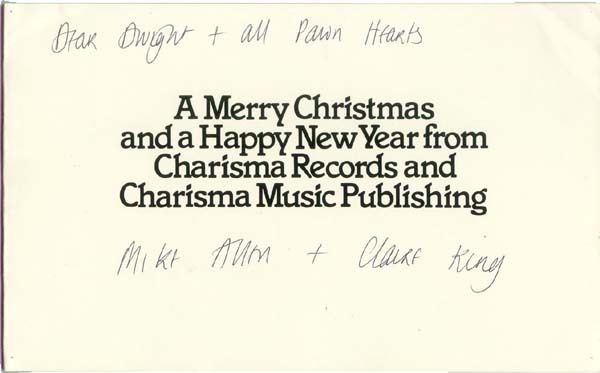 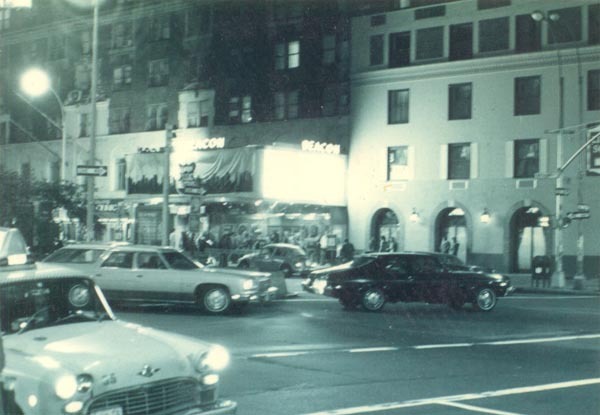 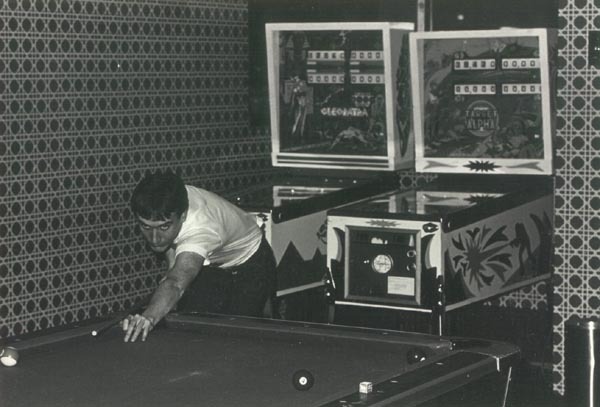 The Pawn Hearts archive (articles, photographs etc.) 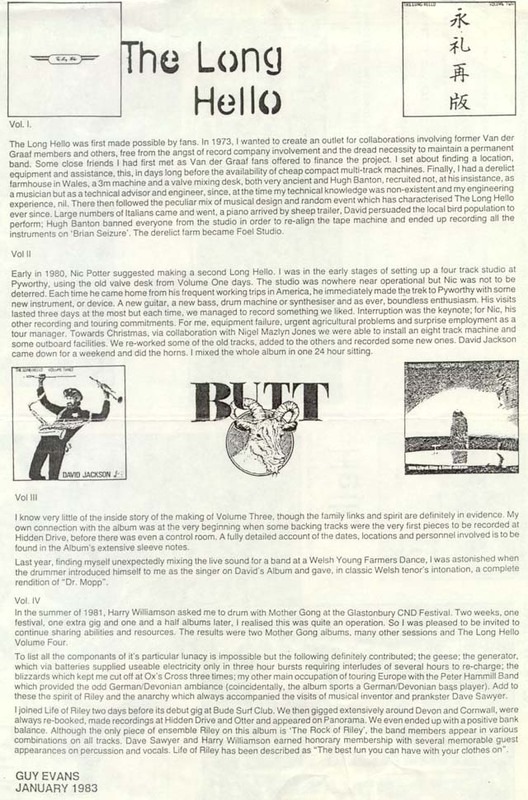 was shipped from Canada to England in 2001 with the intention of displaying as much of the material as possible on the web. 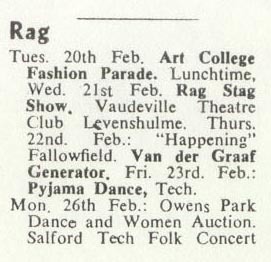 The catalogue (below) has been built up to show what is contained within the archive for the 1968 to 1978 period. 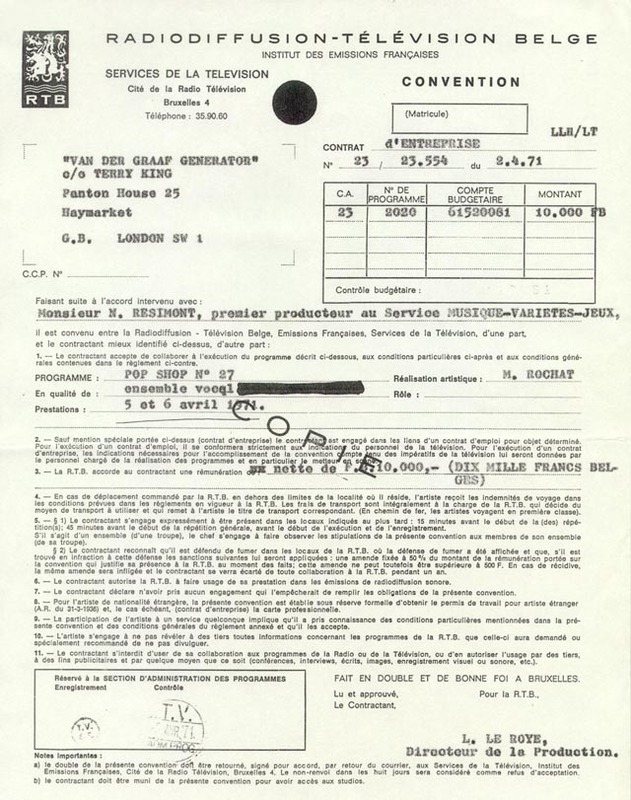 Other material is displayed at affiliated websites (see links at the top of the page). 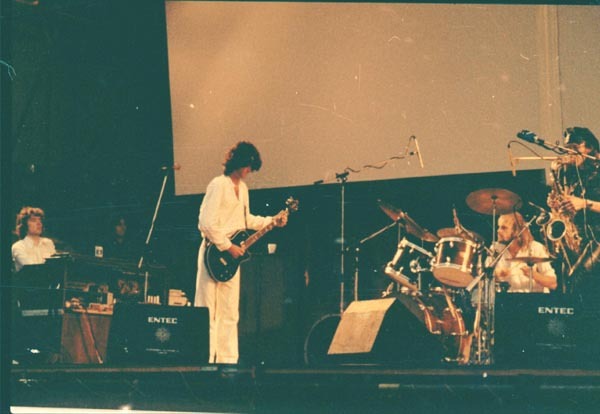 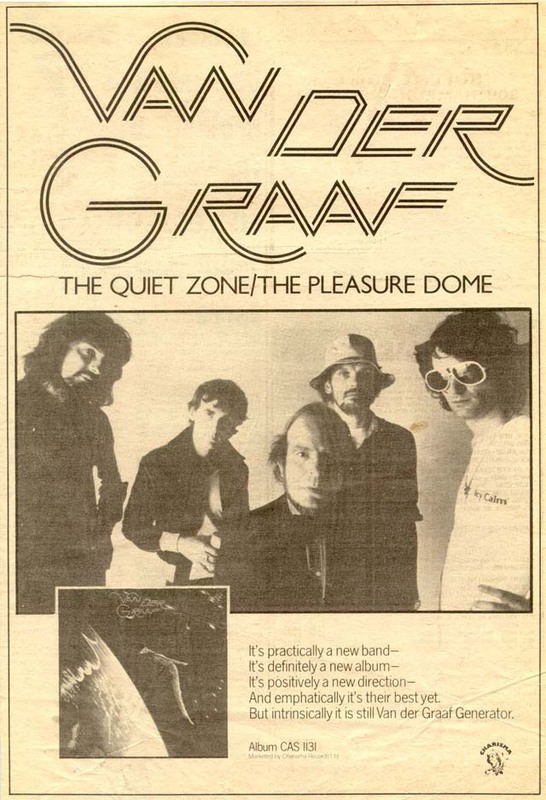 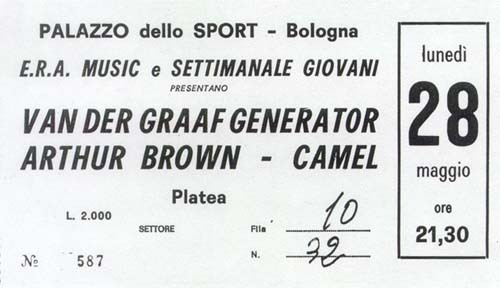 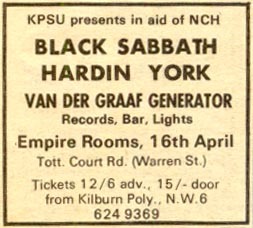 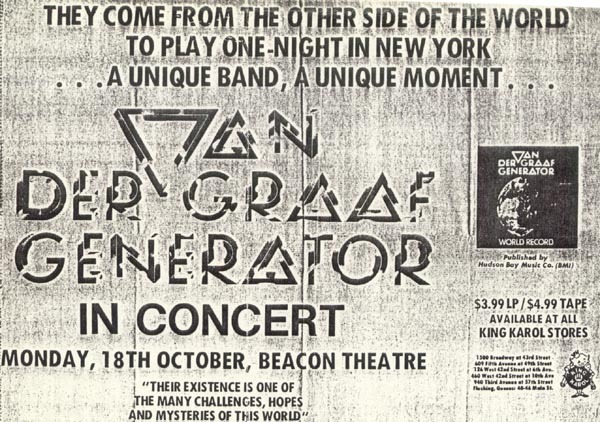 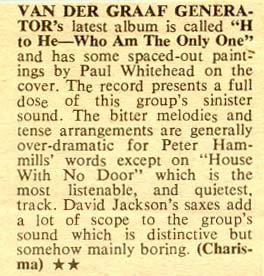 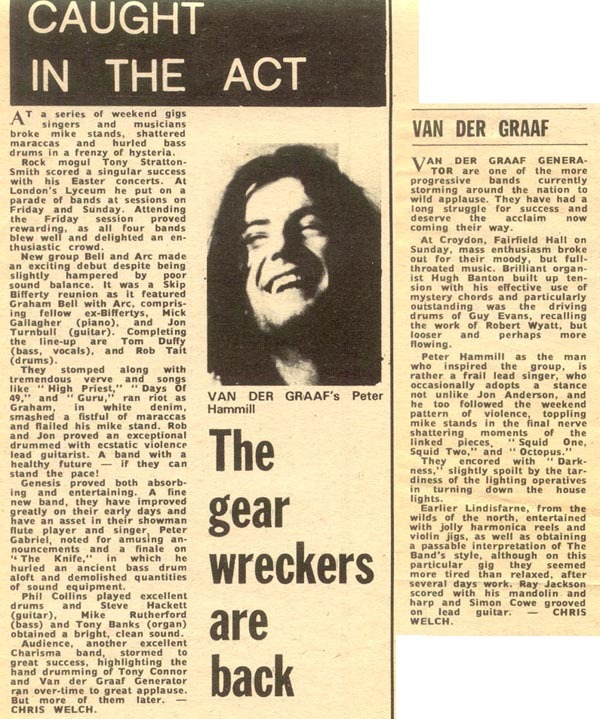 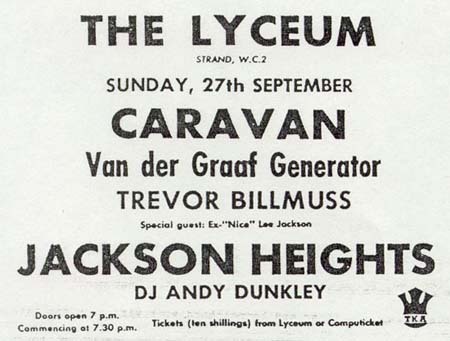 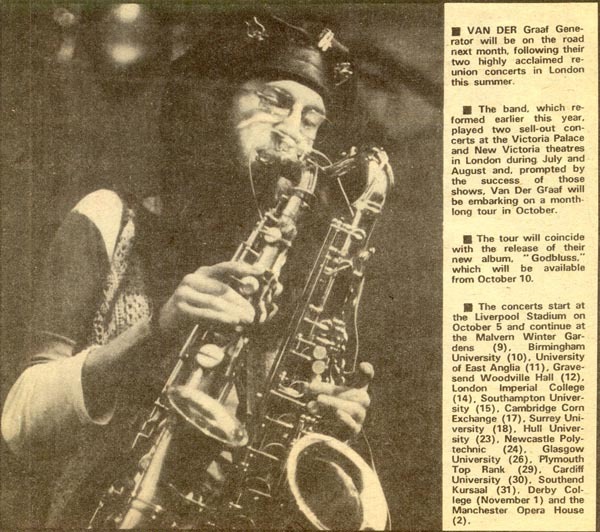 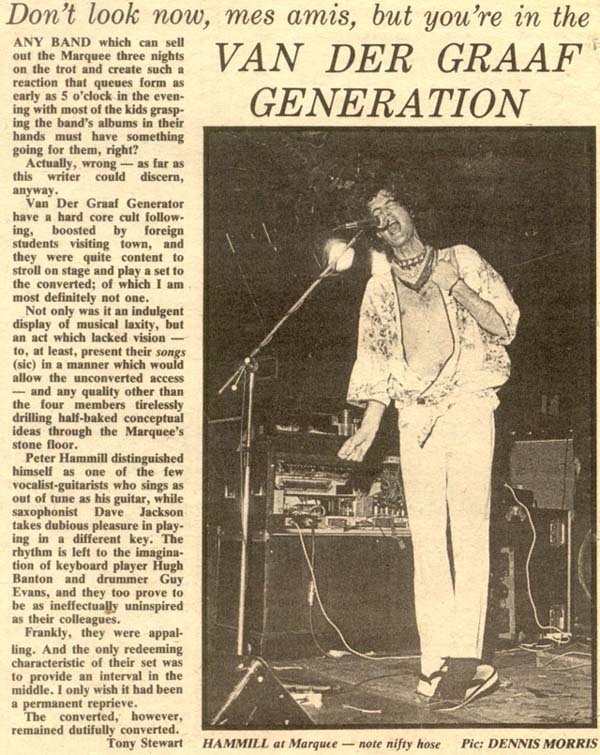 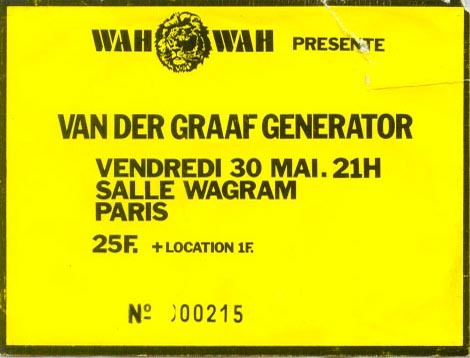 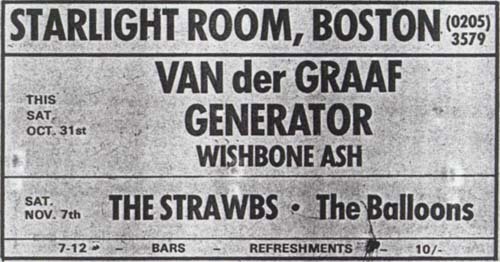 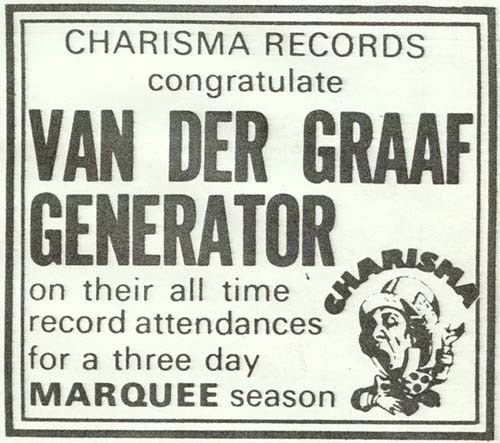 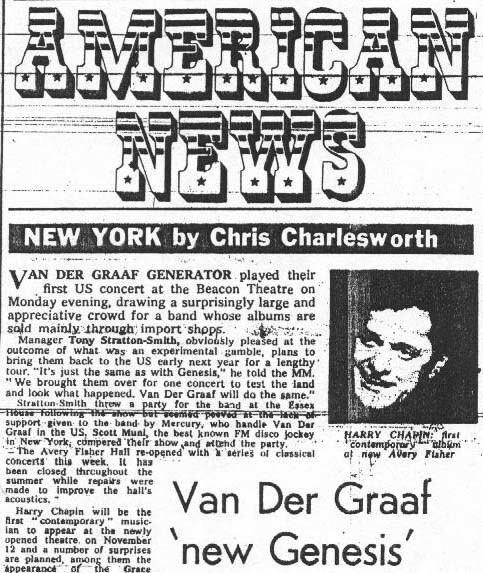 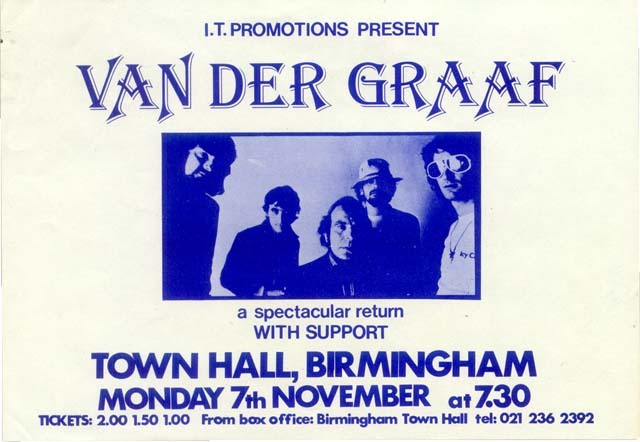 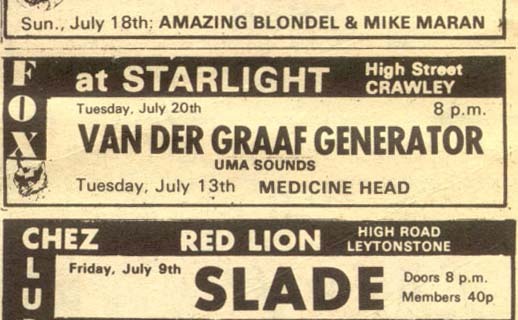 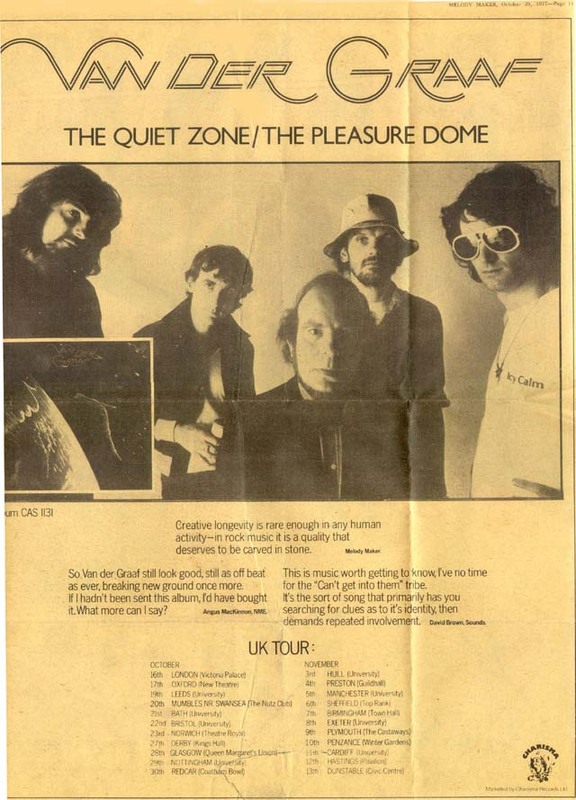 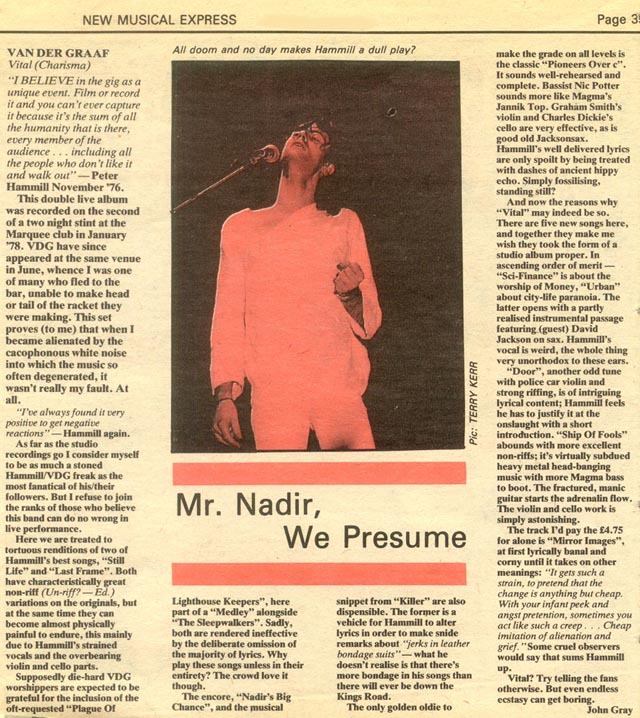 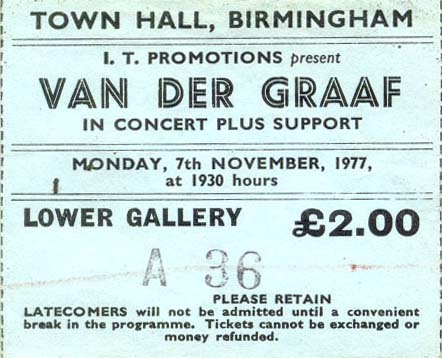 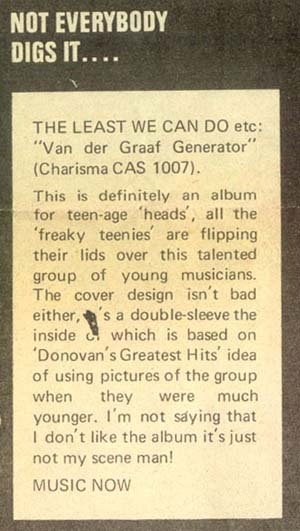 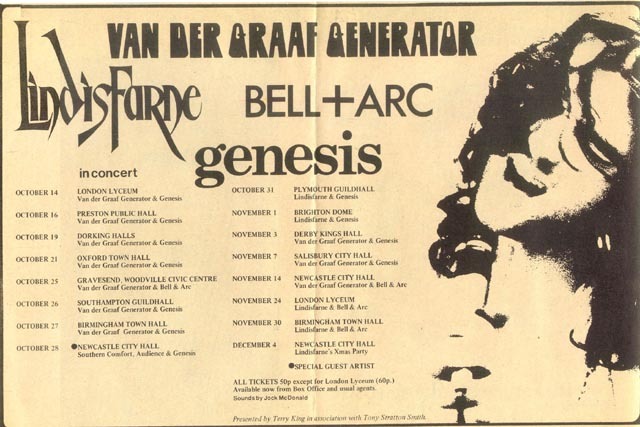 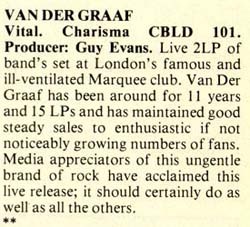 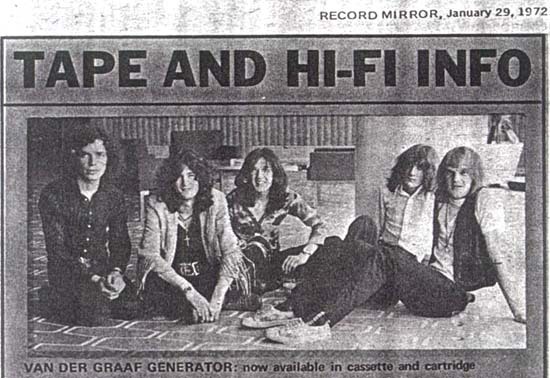 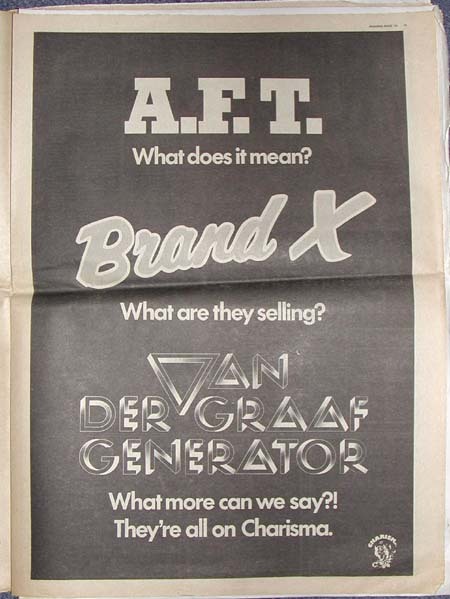 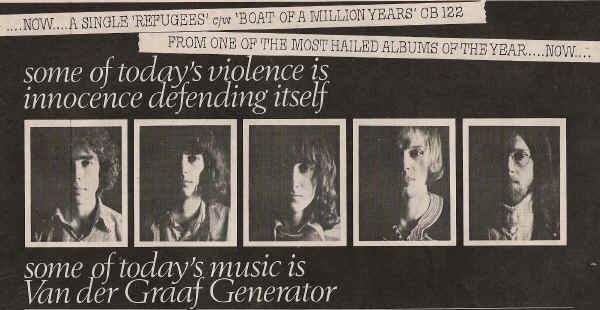 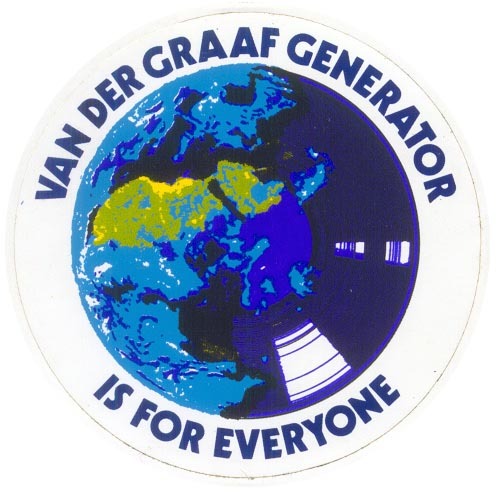 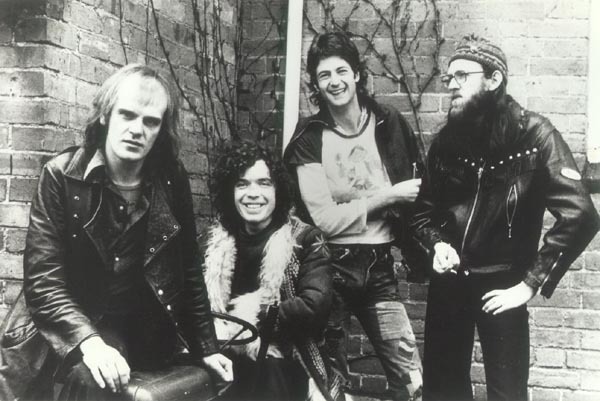 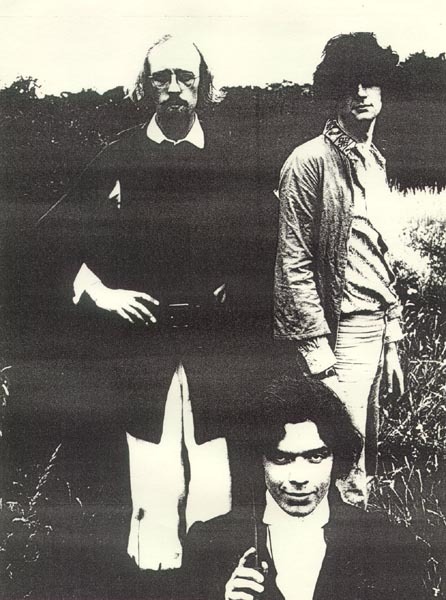 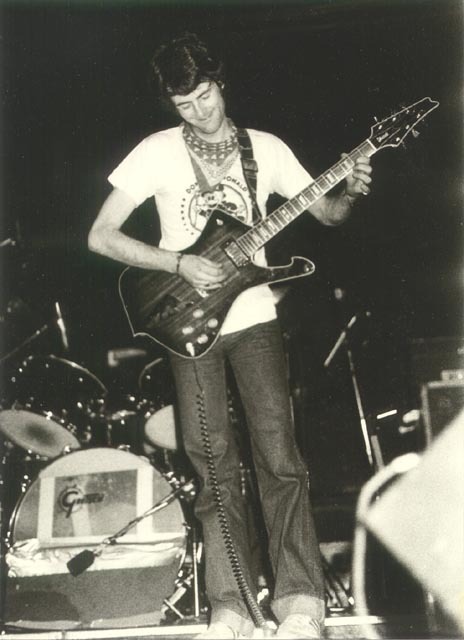 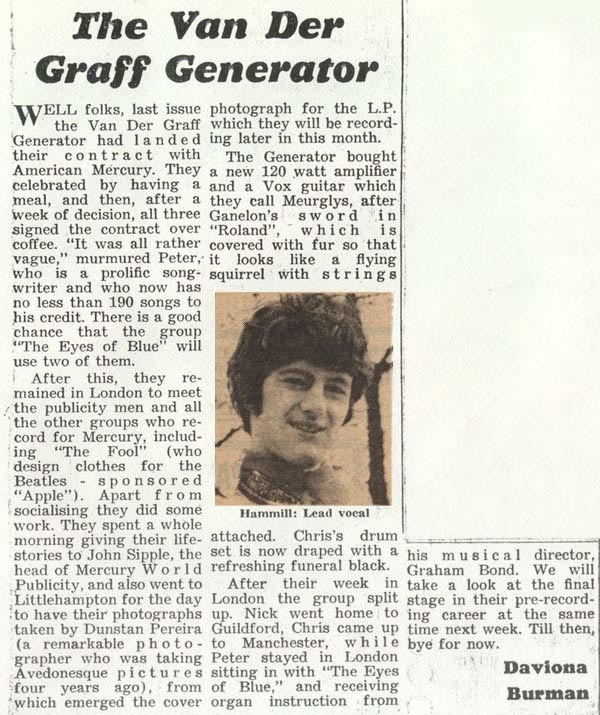 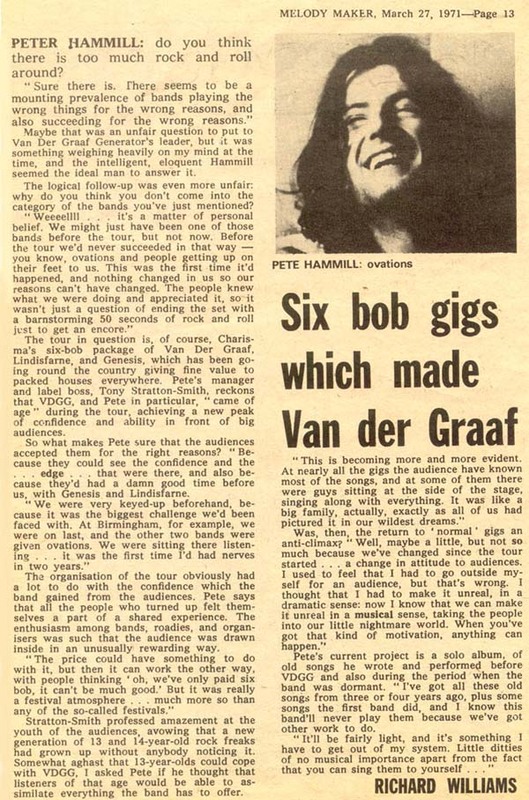 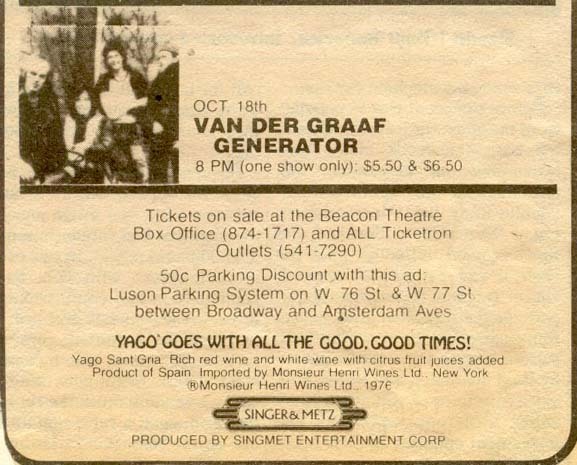 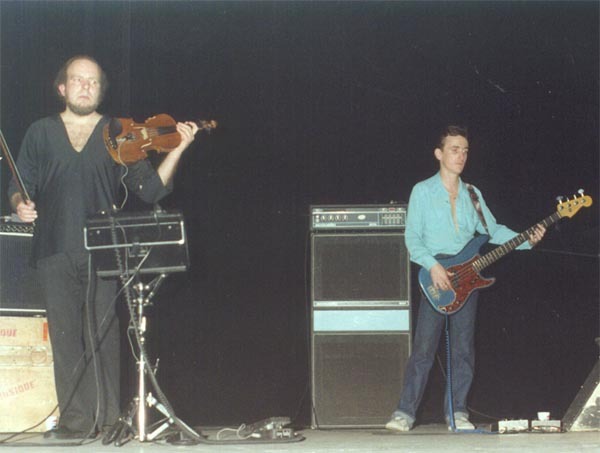 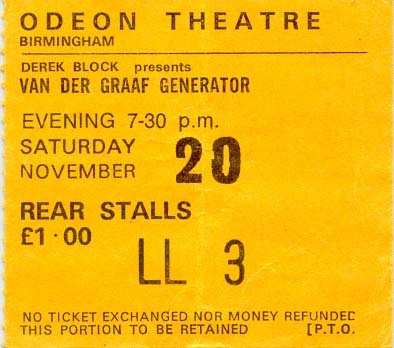 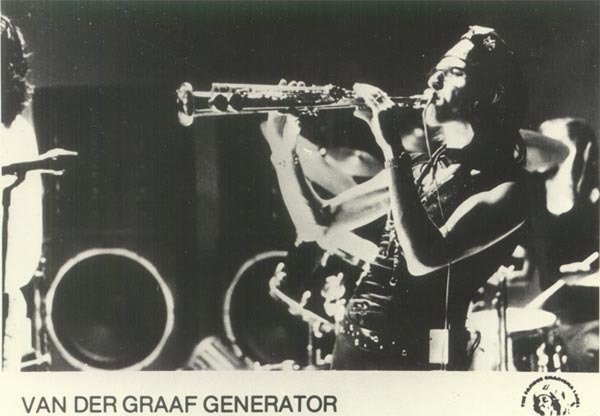 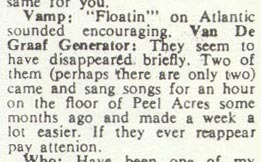 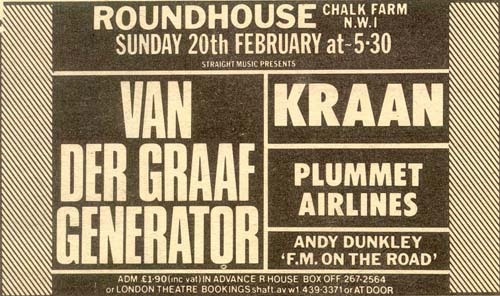 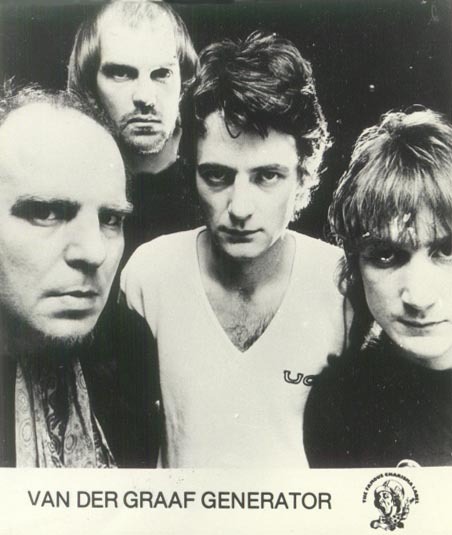 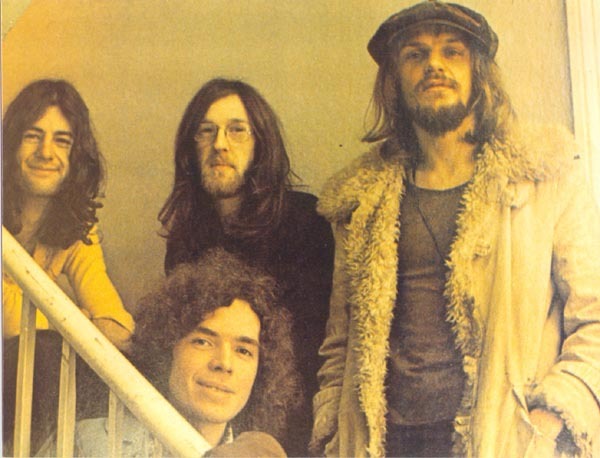 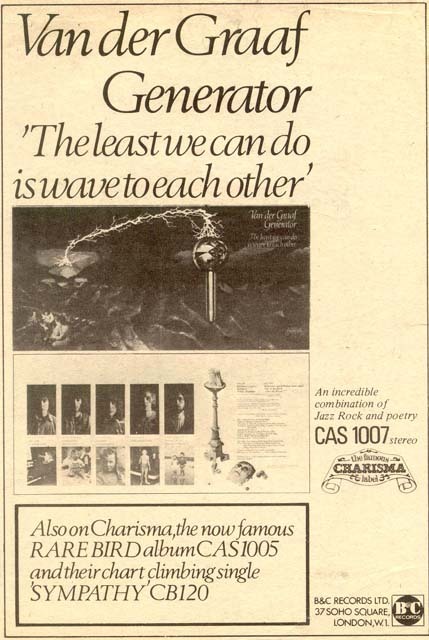 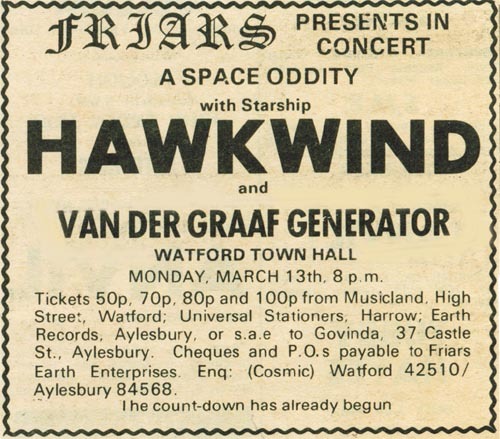 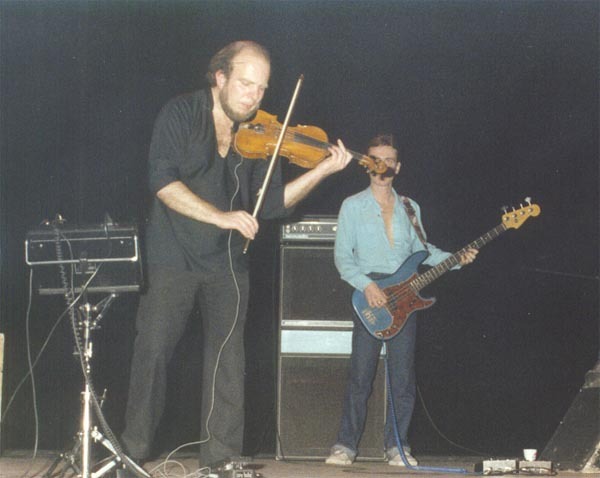 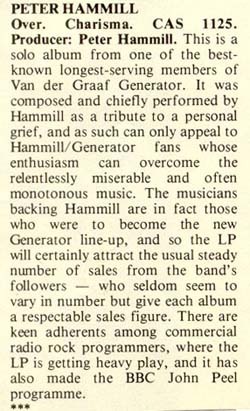 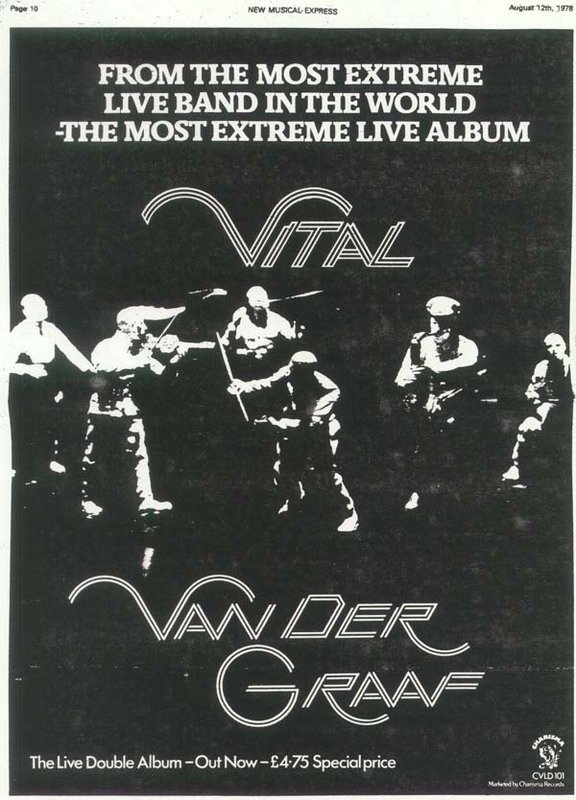 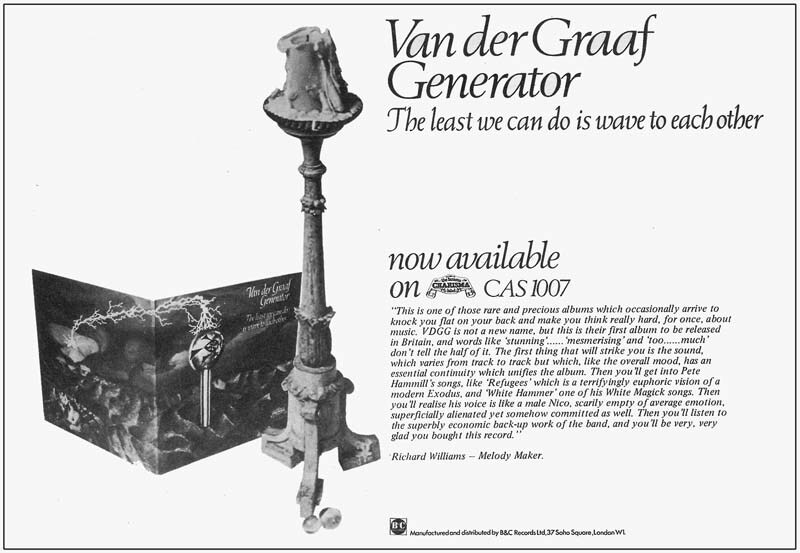 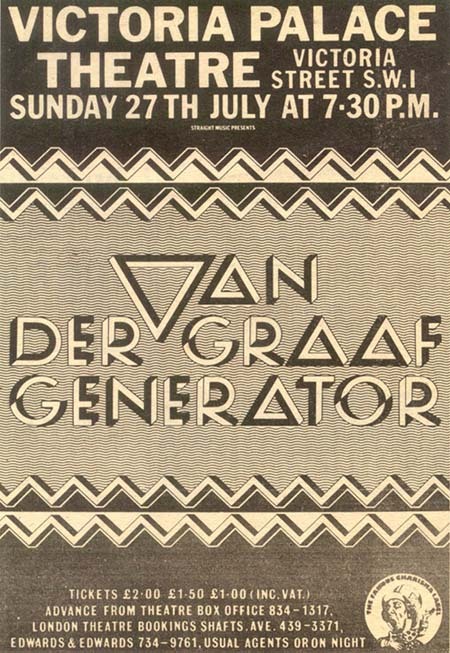 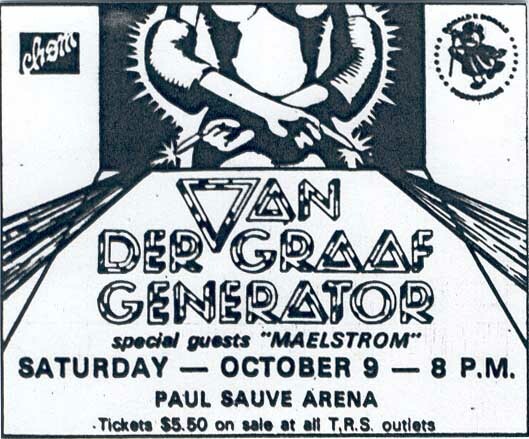 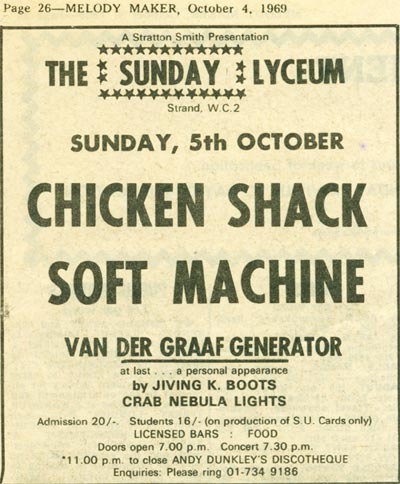 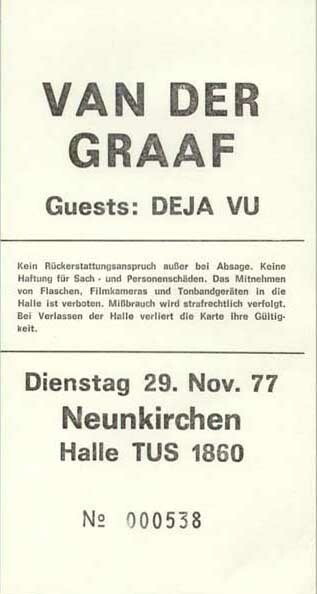 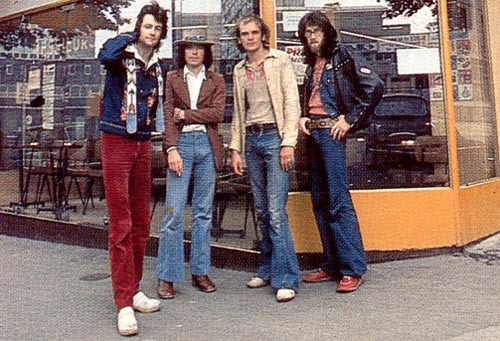 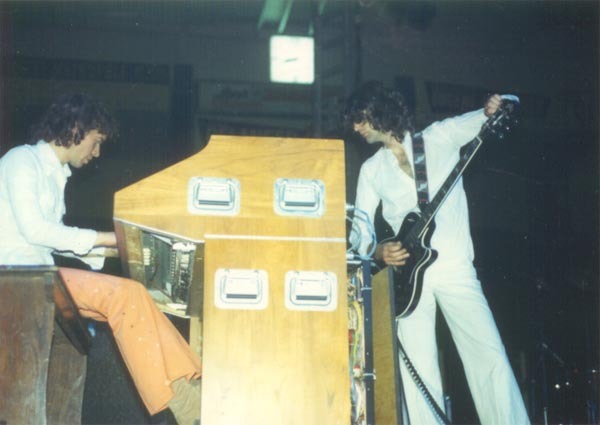 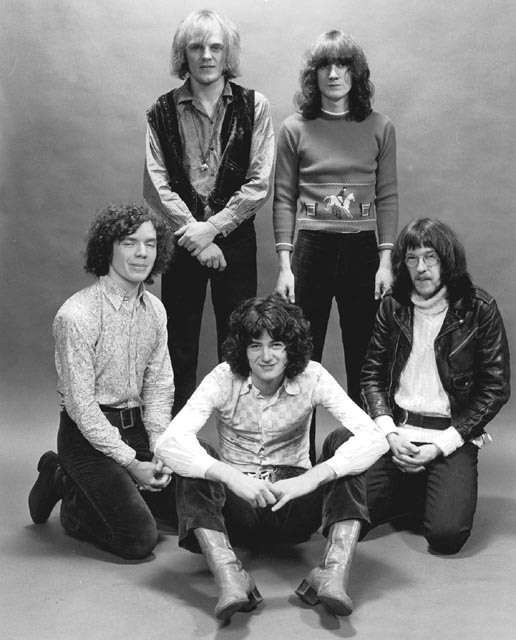 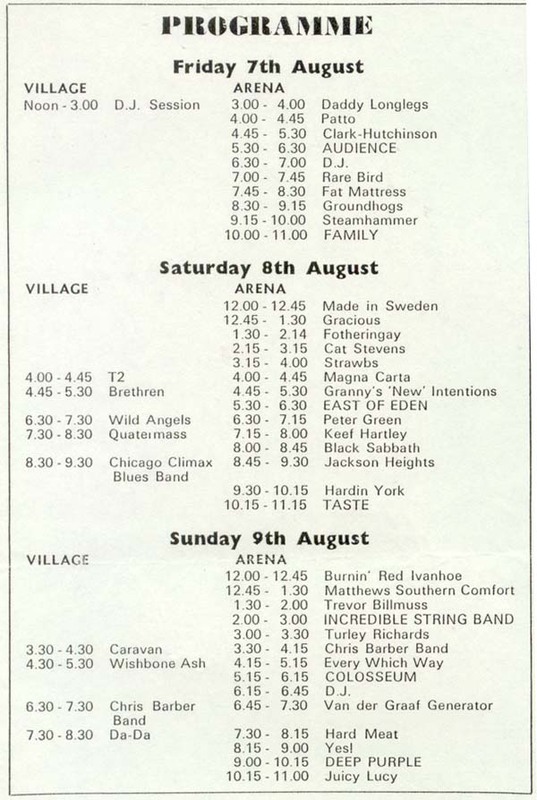 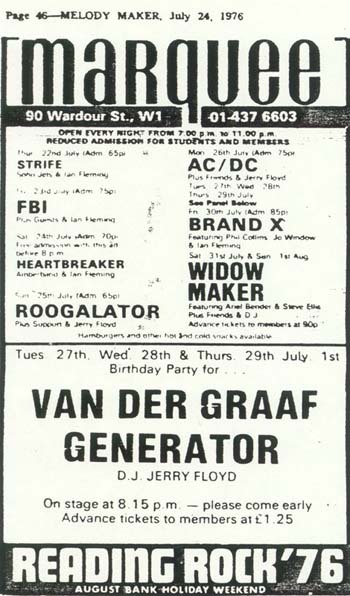 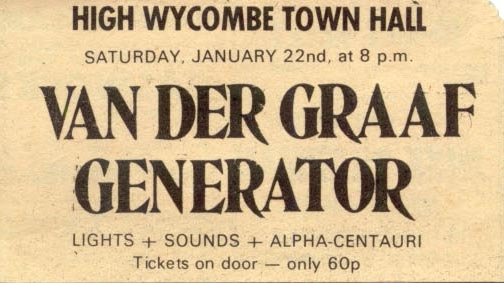 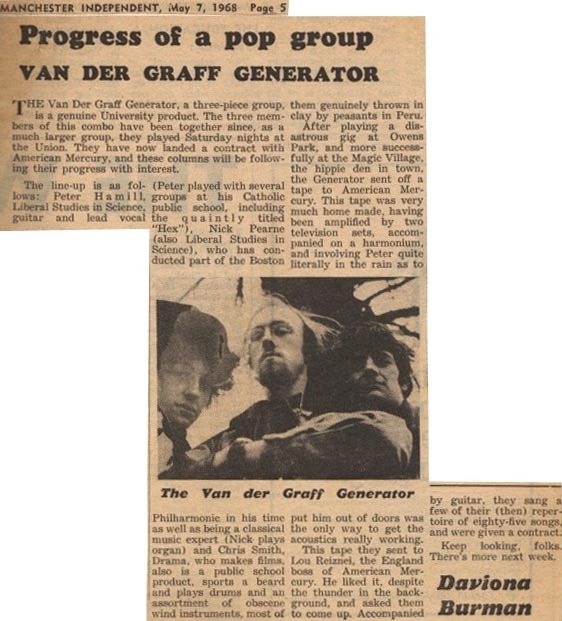 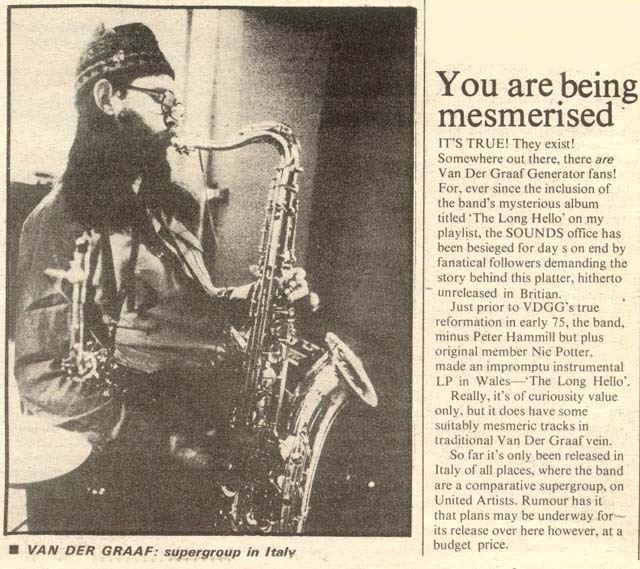 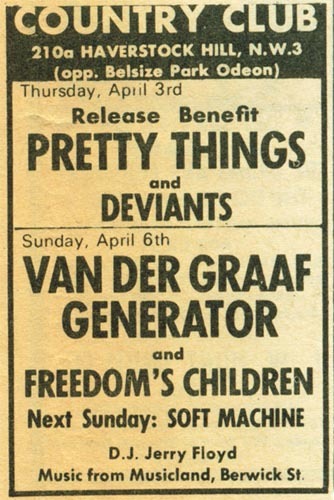 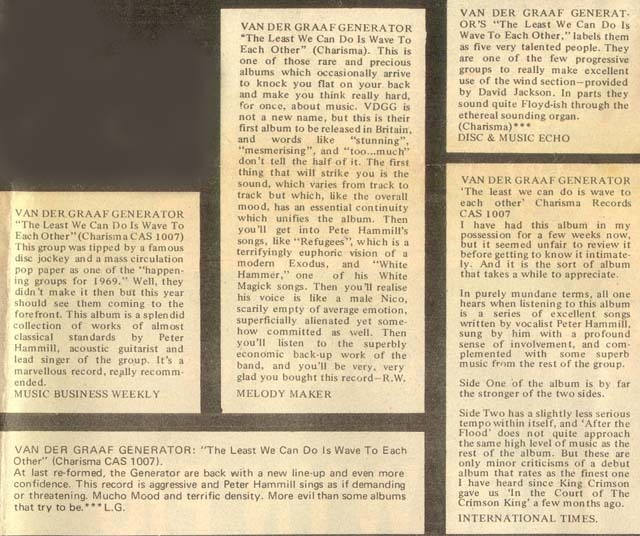 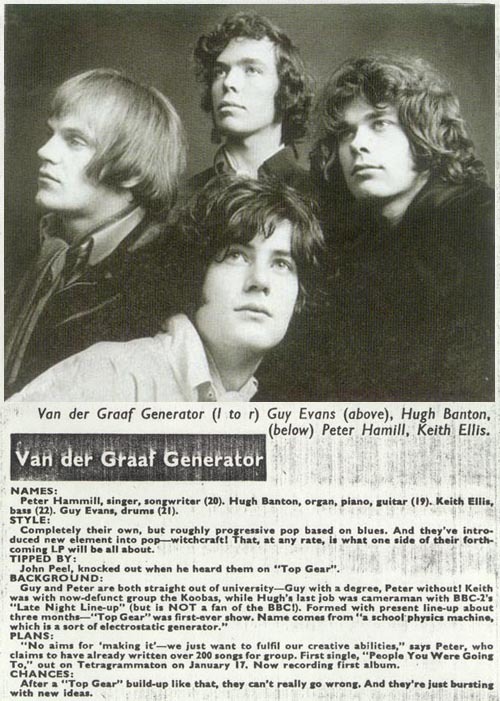 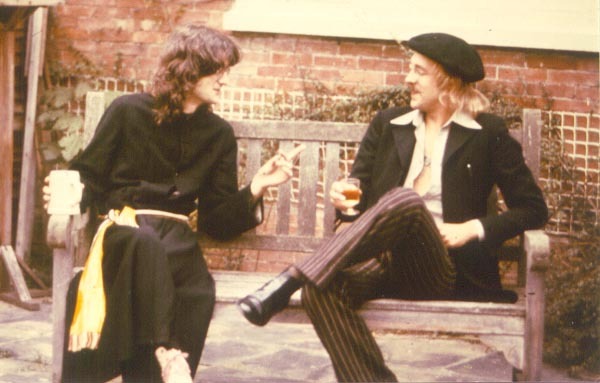 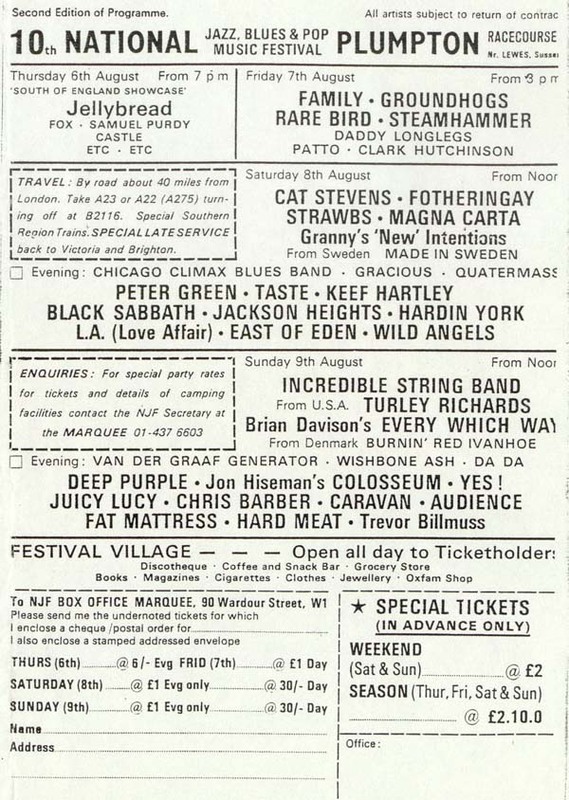 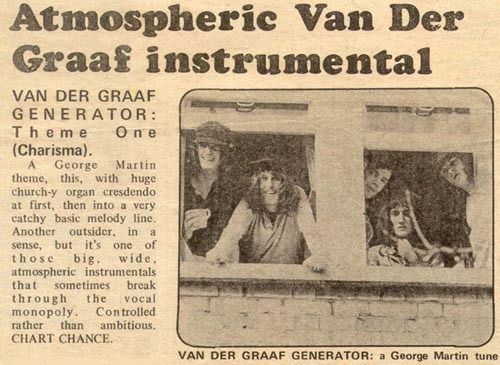 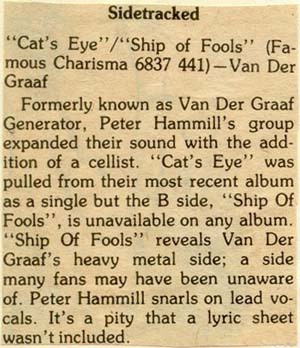 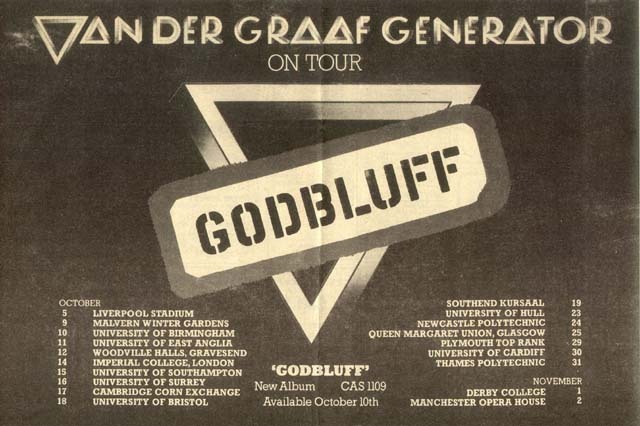 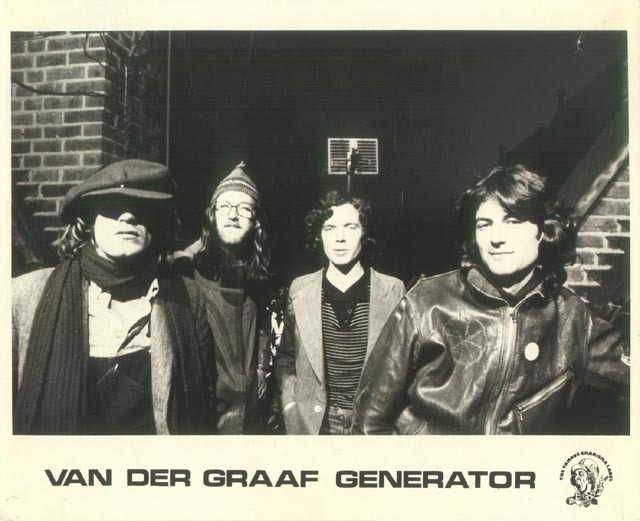 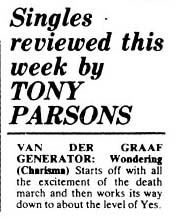 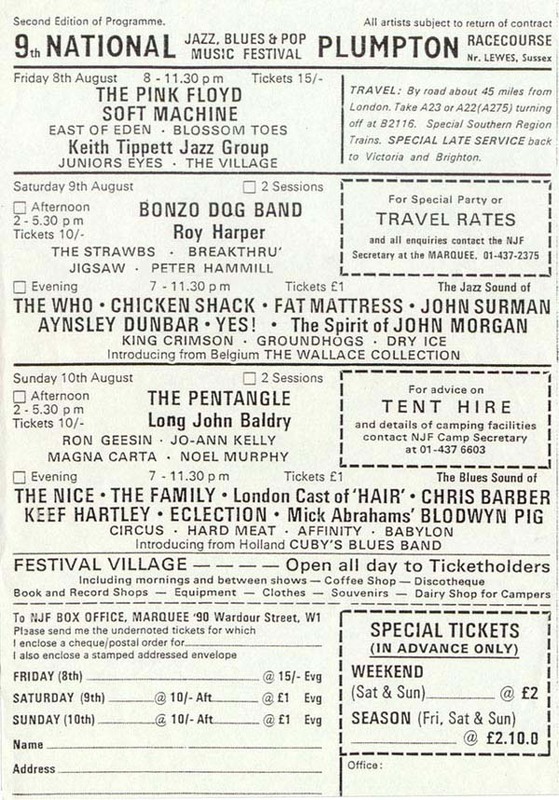 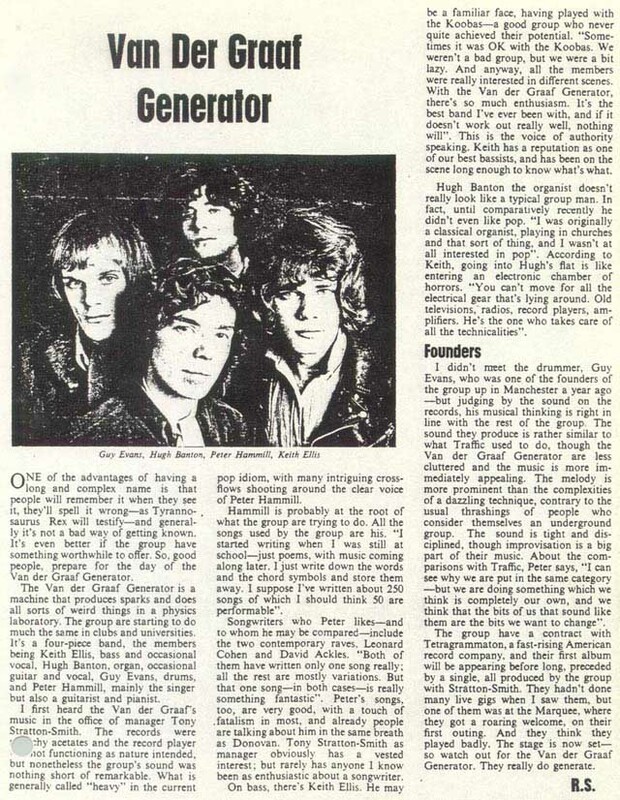 Items that can be viewed on the website will have direct links from the catalogue as well as from www.vandergraafgenerator.co.uk, the history of Van der Graaf Generator. 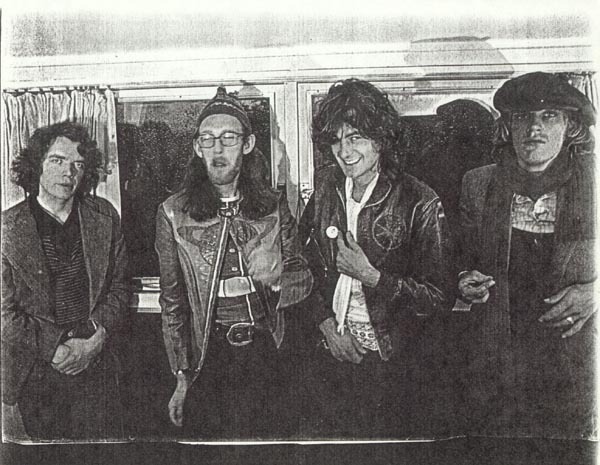 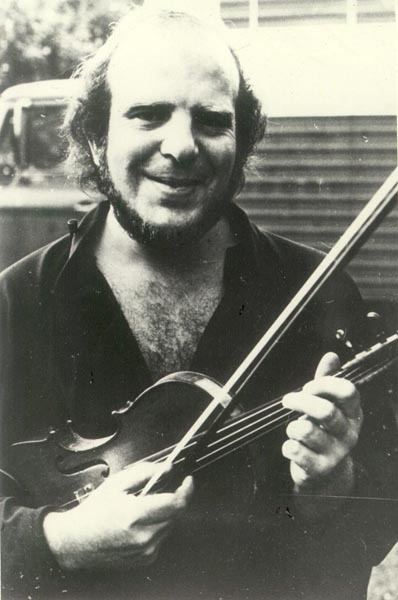 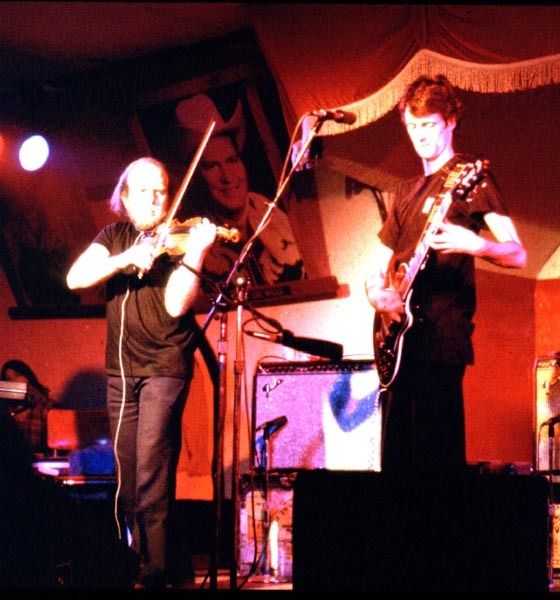 The Pawn Hearts Society was started by Dwight Hansen of Detroit, U.S.A., in 1977. 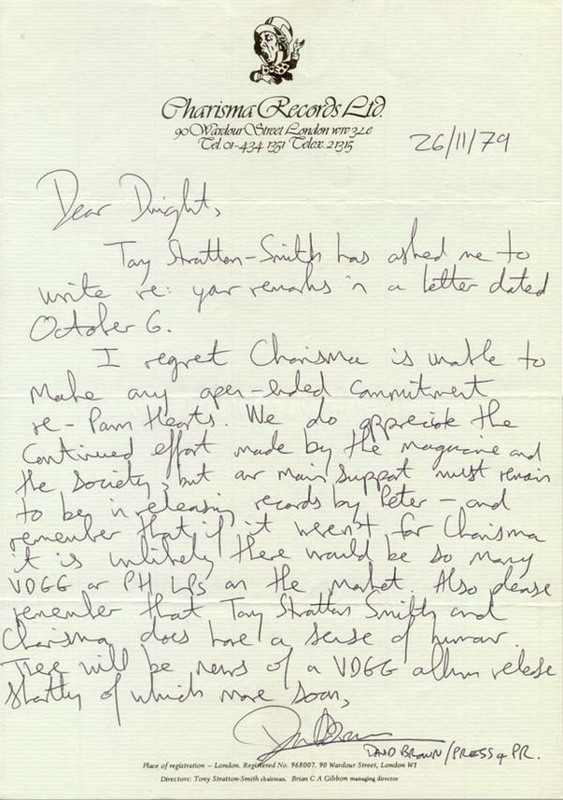 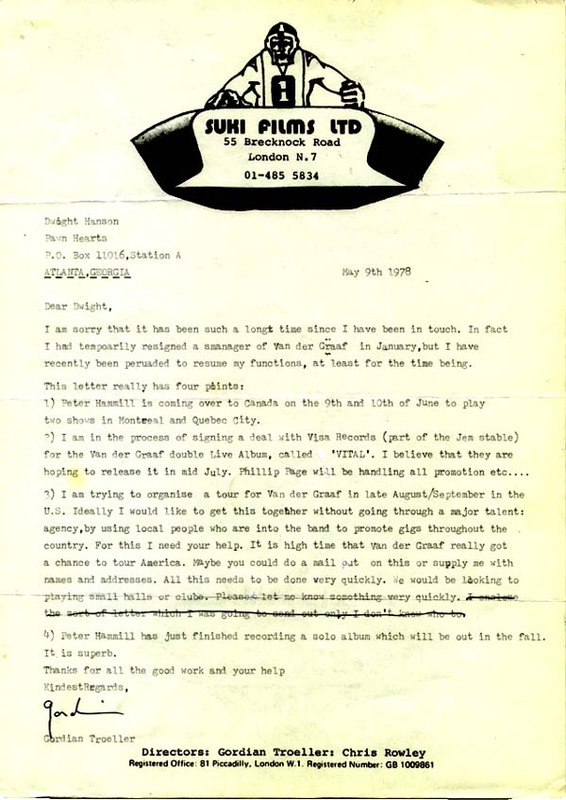 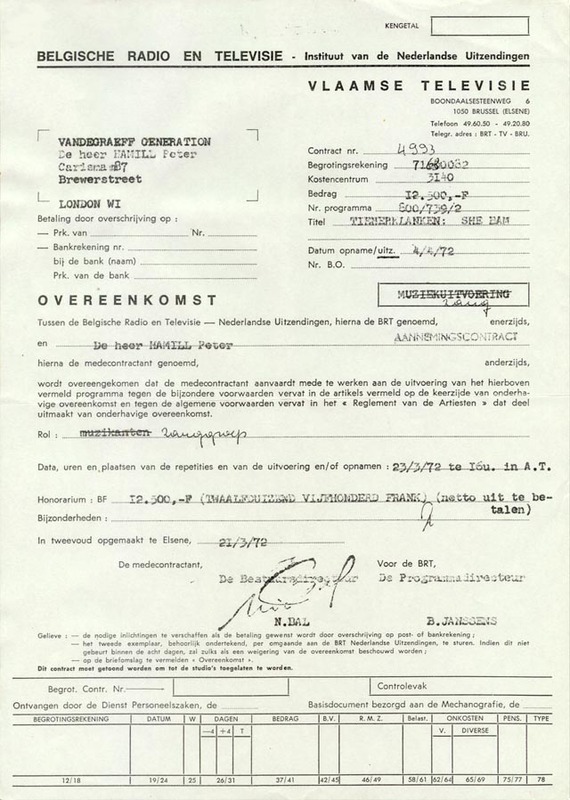 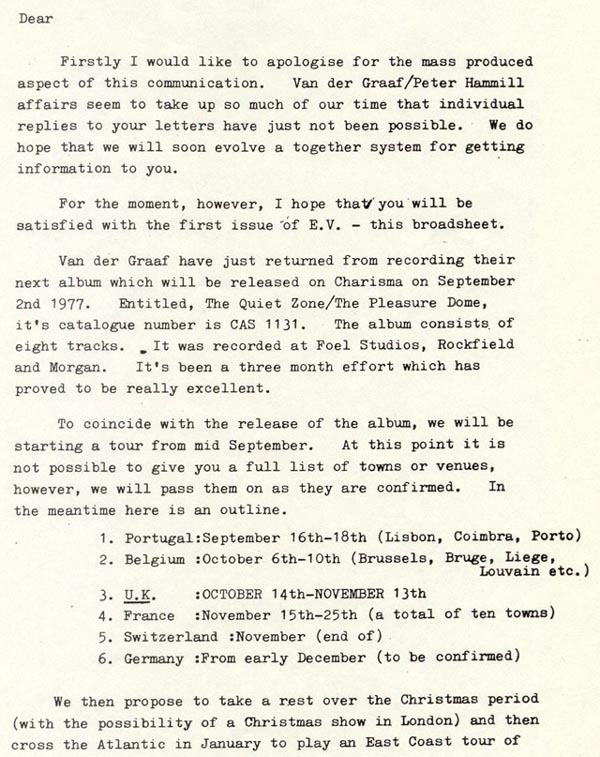 The name however was suggested by Phillip Page, Manager of Import Records Label, New Jersey, as this letter shows. 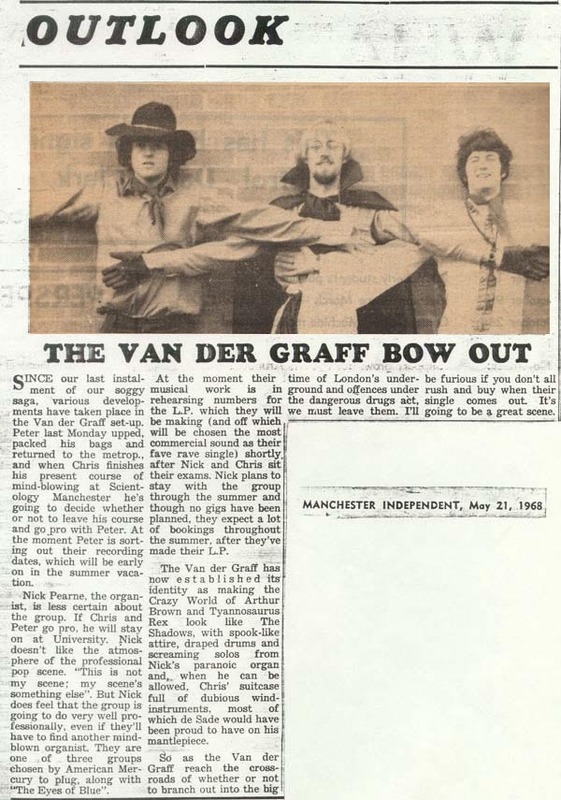 The archive was gradually built up to include articles, pictures, album releases and concert recordings from all over the world. 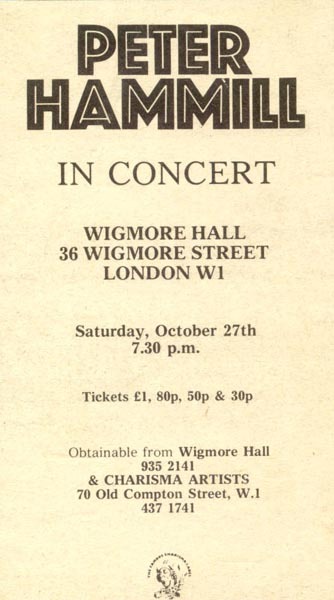 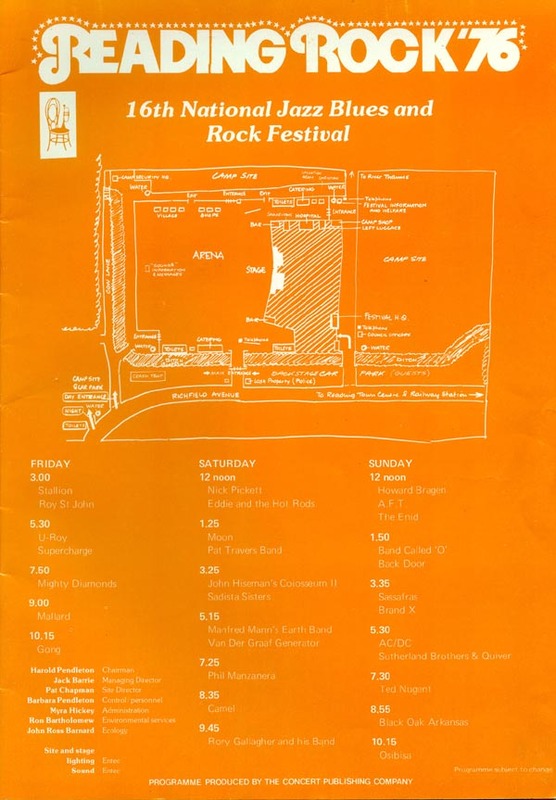 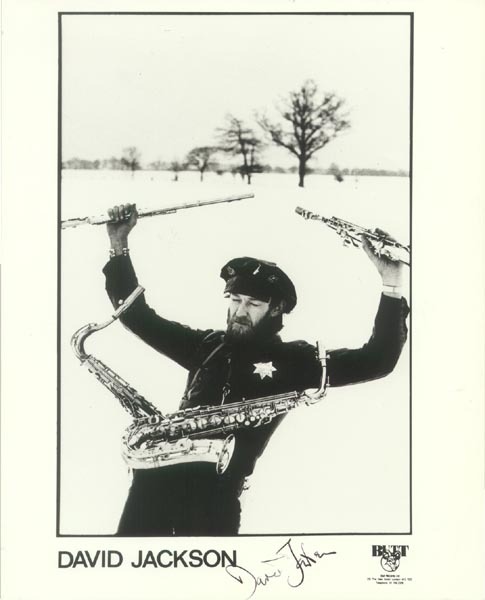 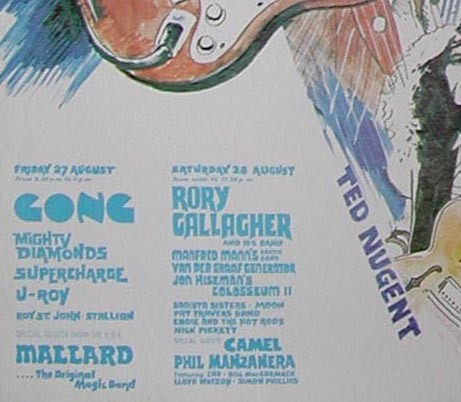 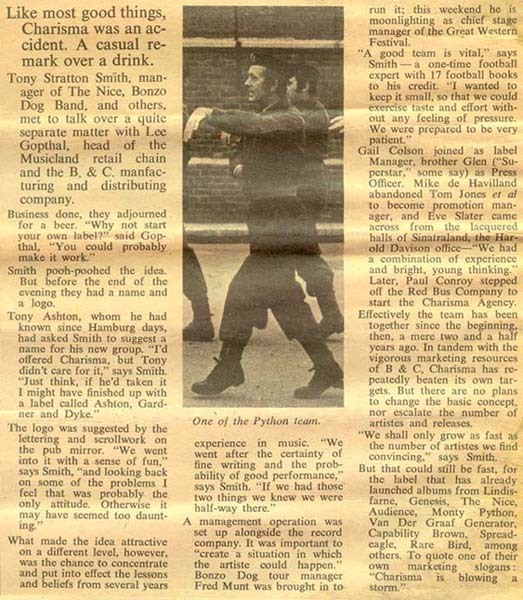 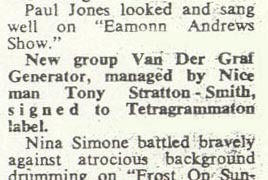 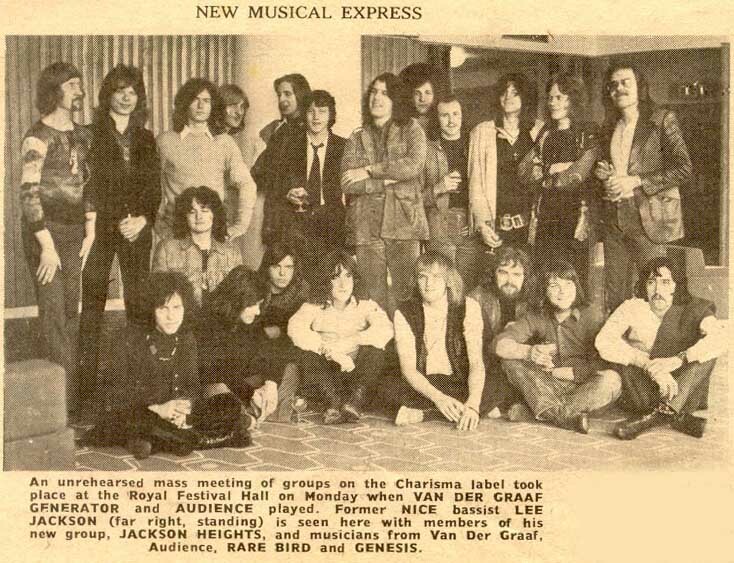 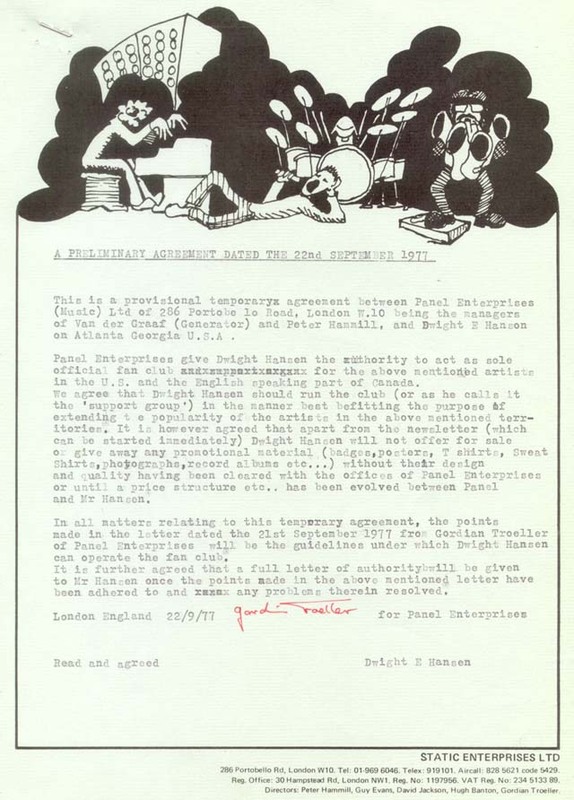 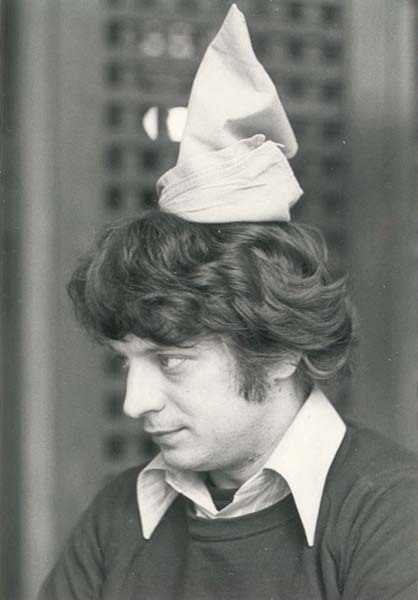 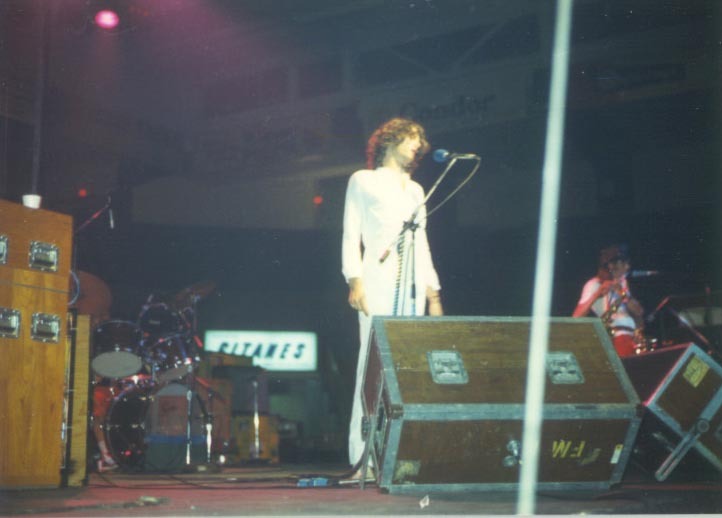 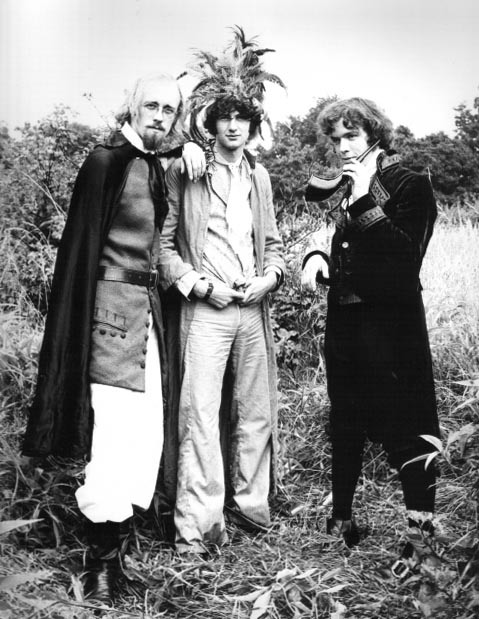 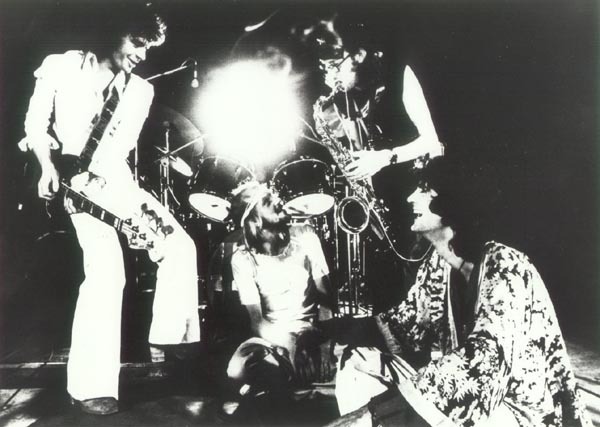 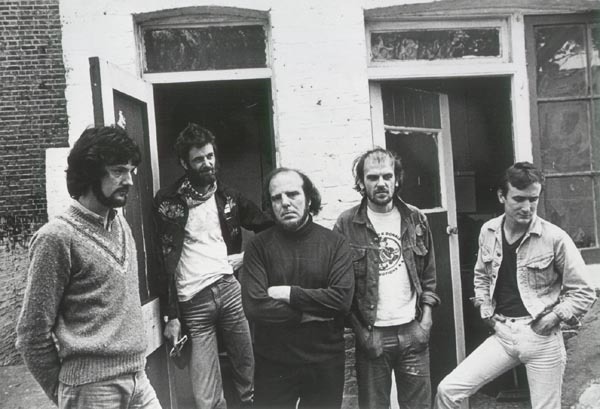 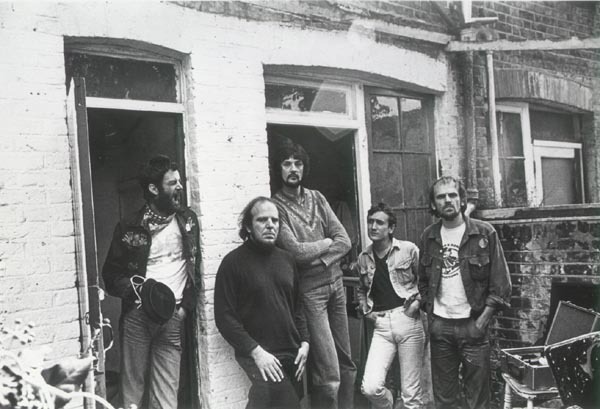 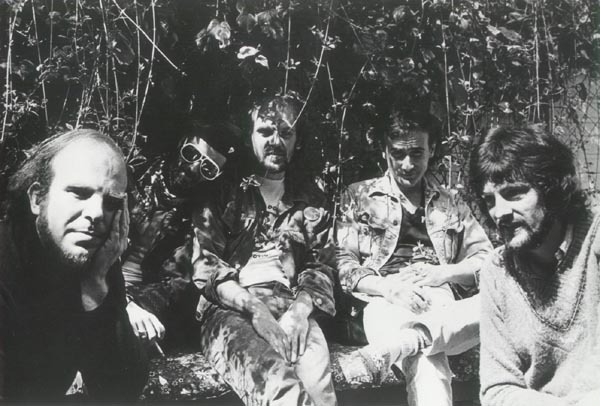 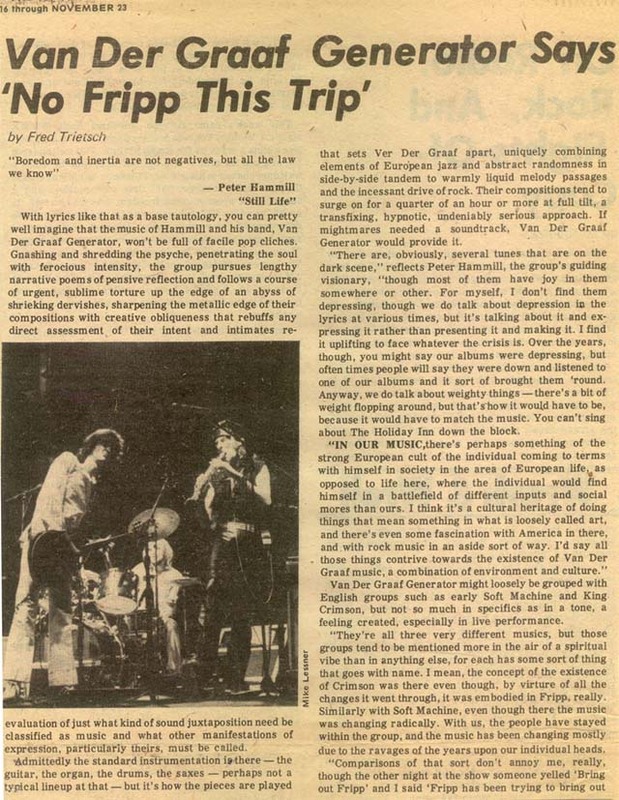 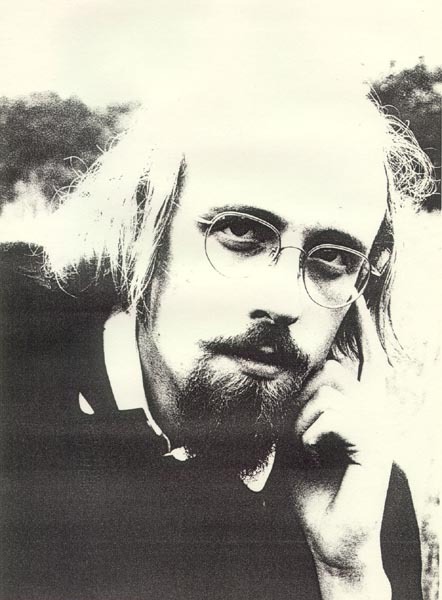 The society appears to have been well supported by the individual band members and Gordian Troeller, the band's manager, who wrote this "preliminary provisional temporary agreement" in September 1977. 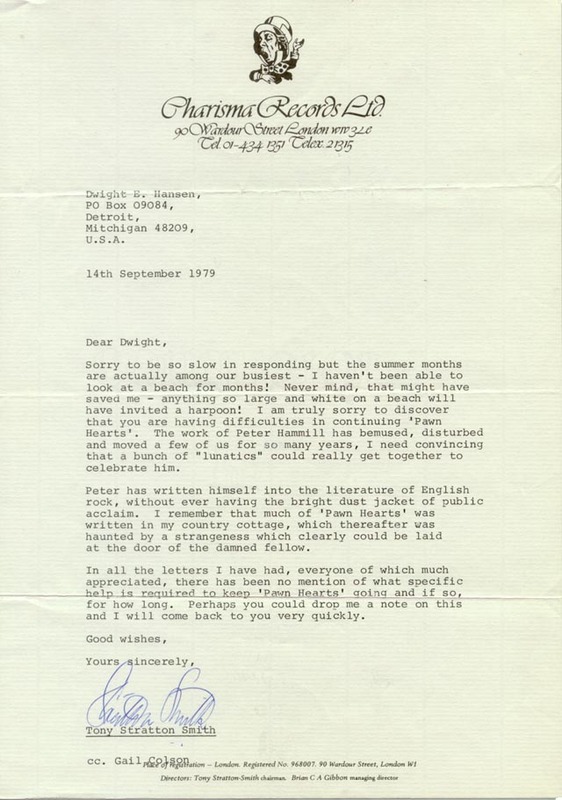 Gordian Troeller was not that enthused with the idea originally but must have come round later, as this letter indicates. 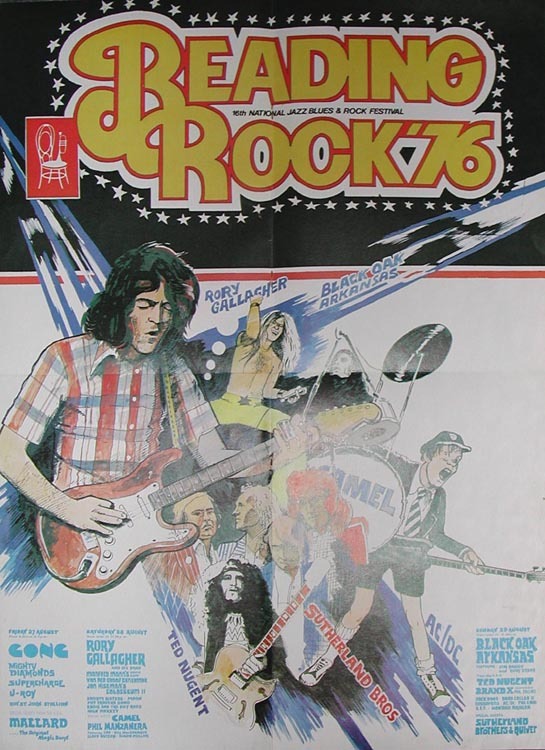 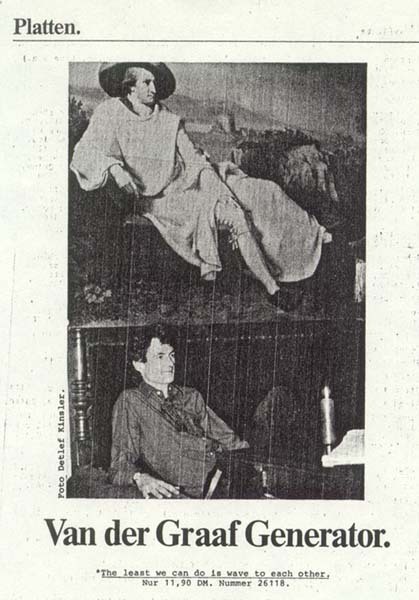 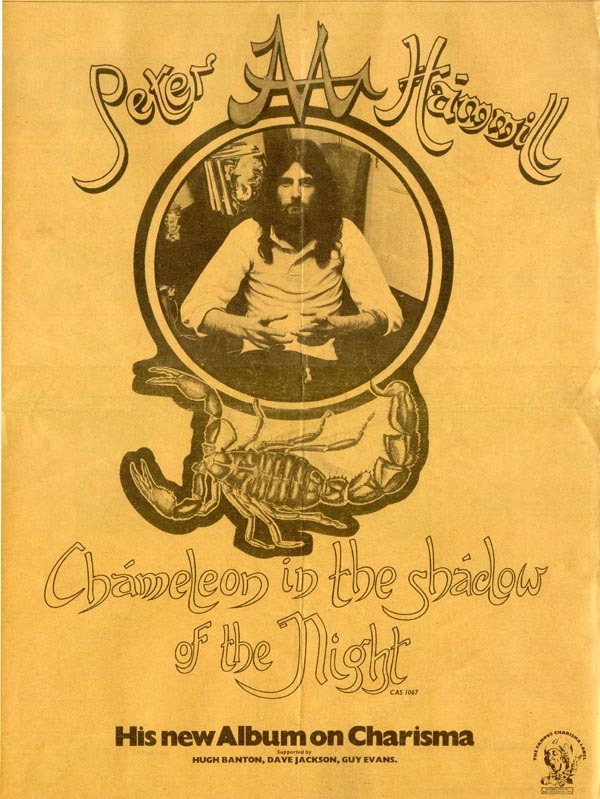 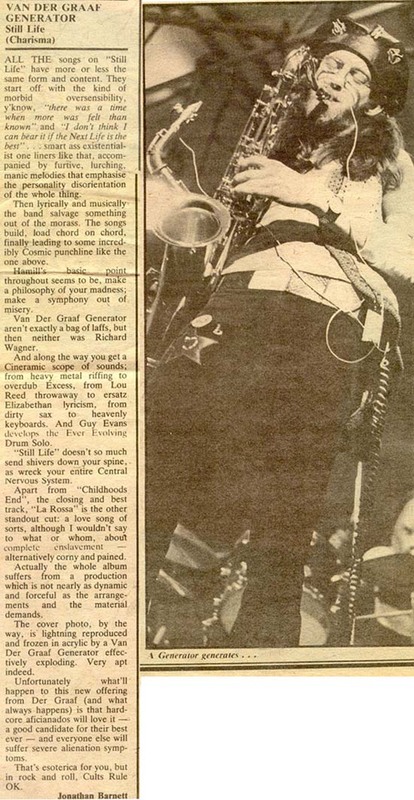 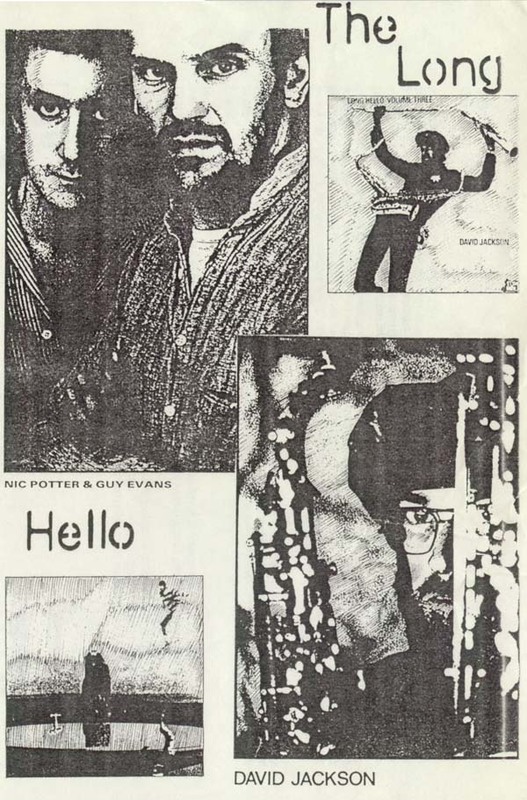 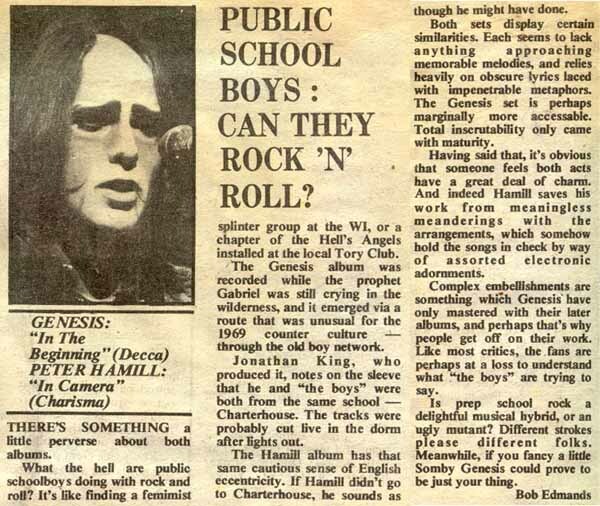 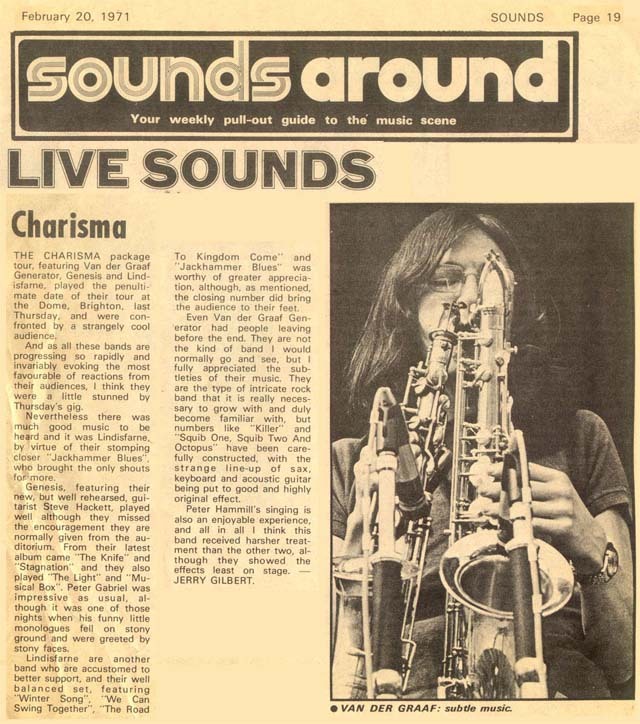 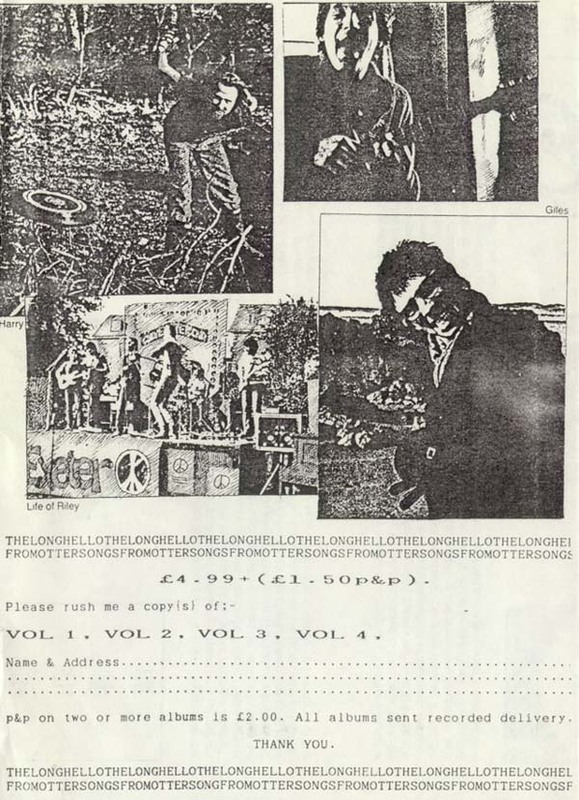 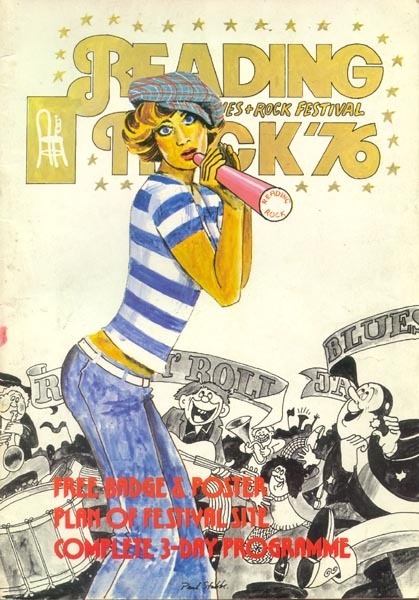 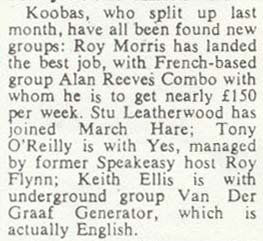 The 1st June 1978 saw the publication of the first newsletter. 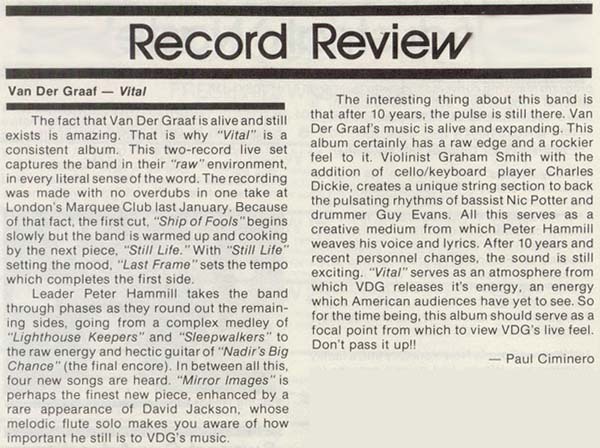 (There is some mis-information about Vital which is corrected in the second newsletter). 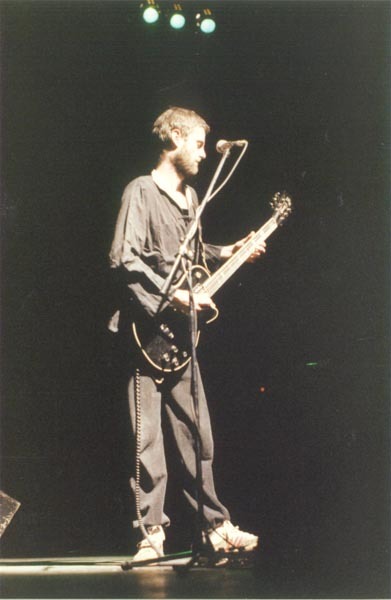 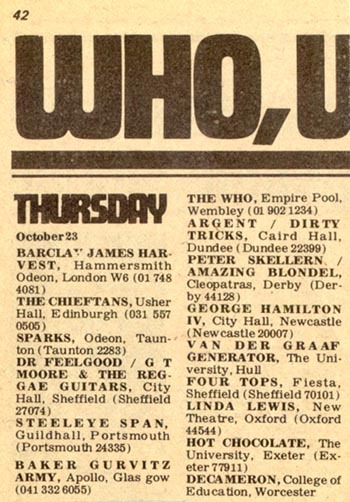 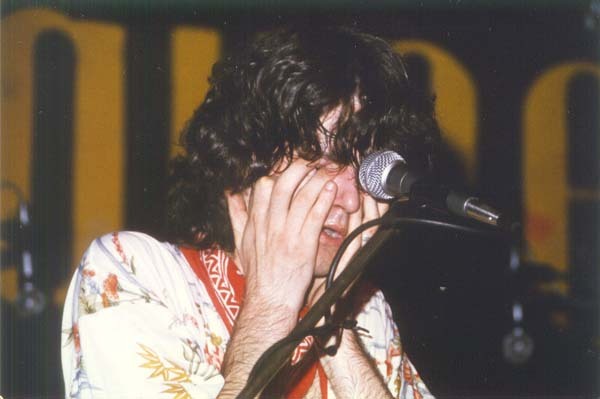 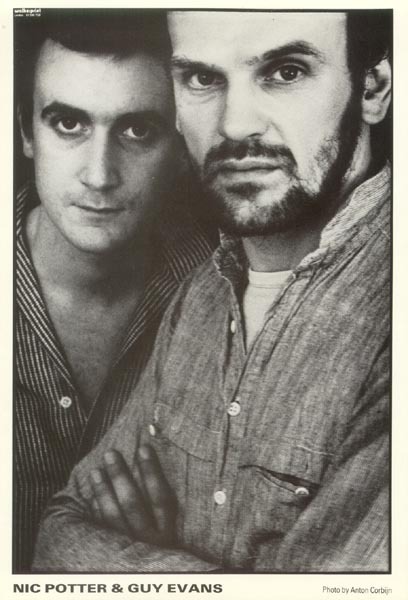 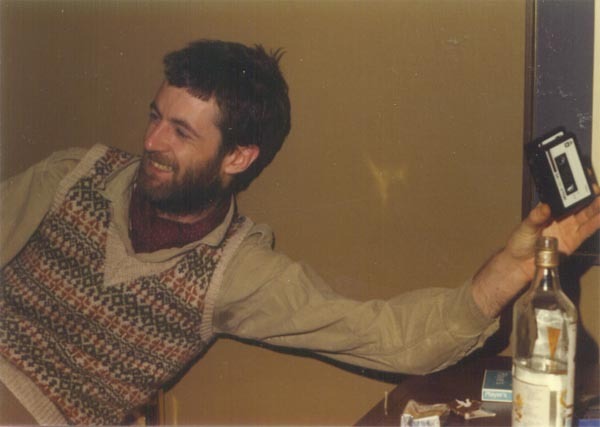 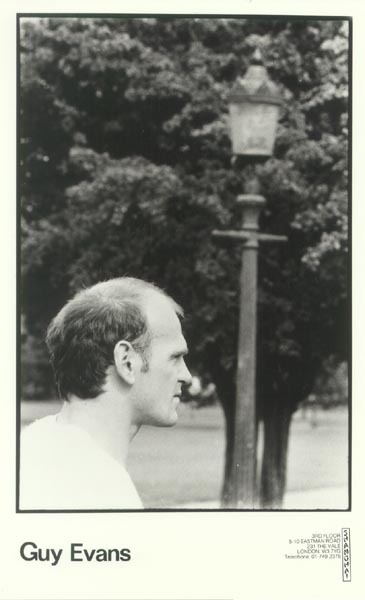 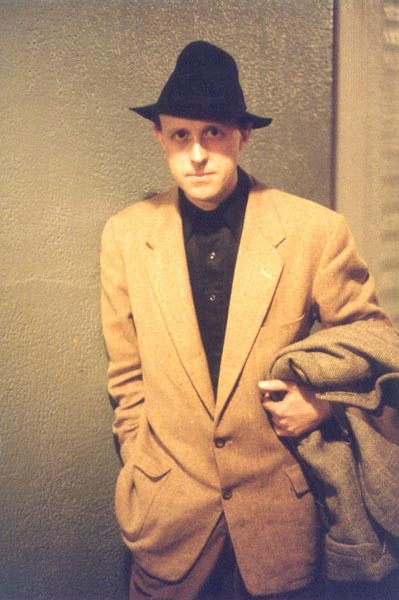 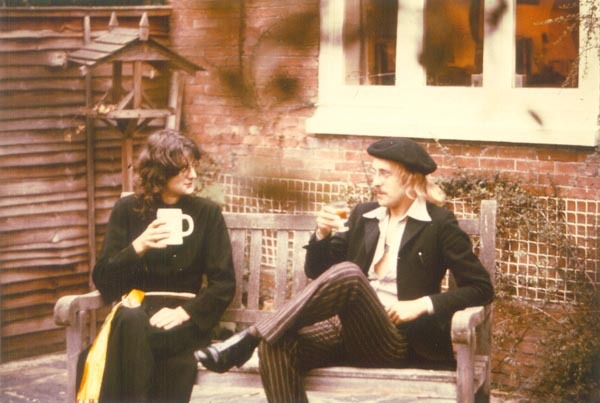 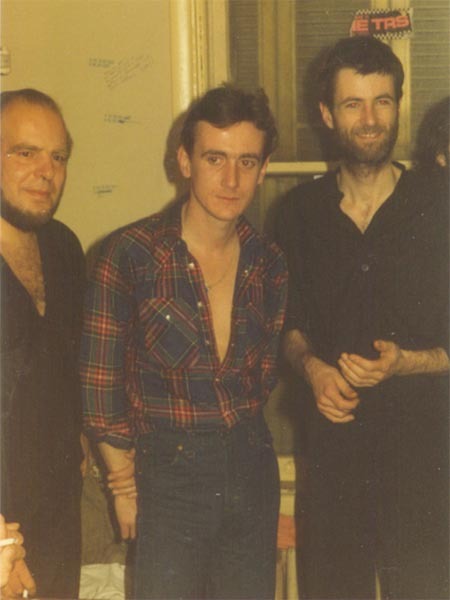 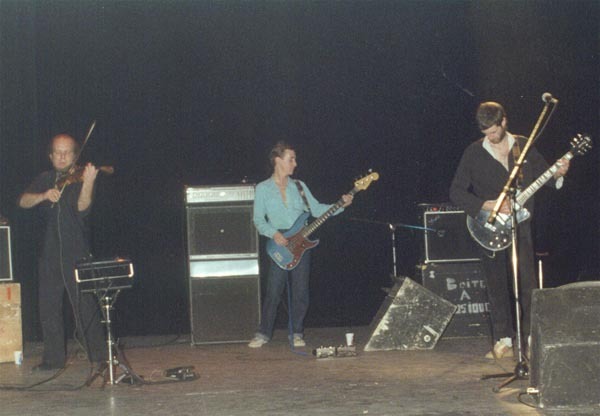 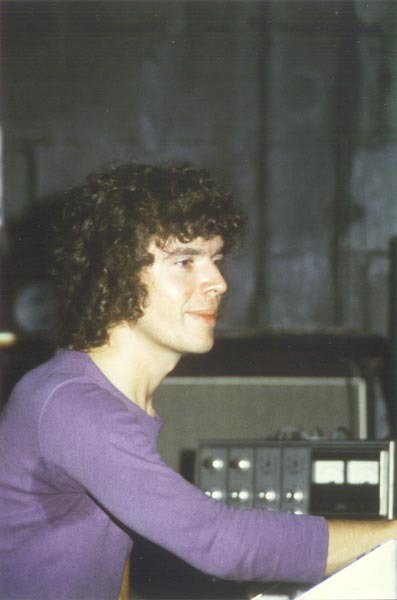 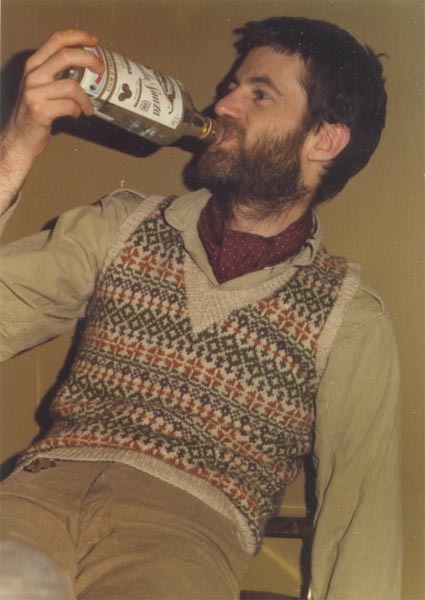 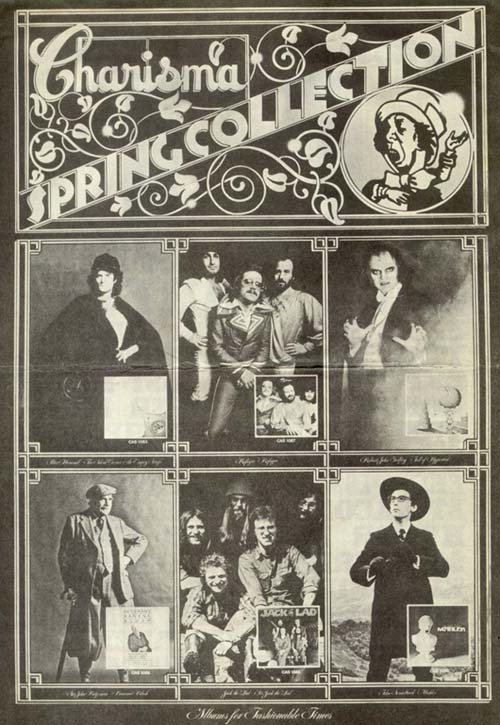 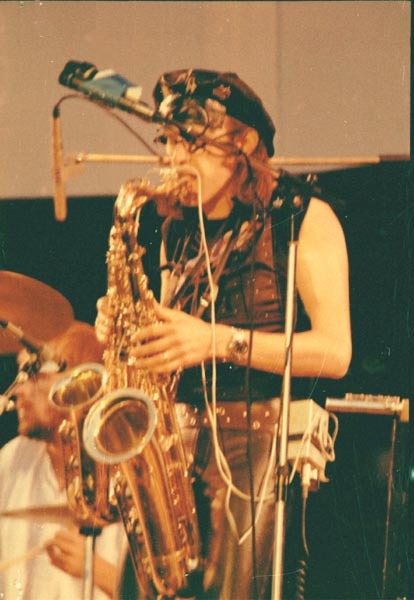 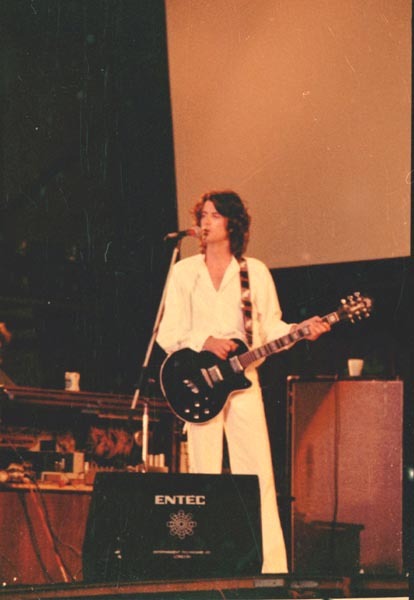 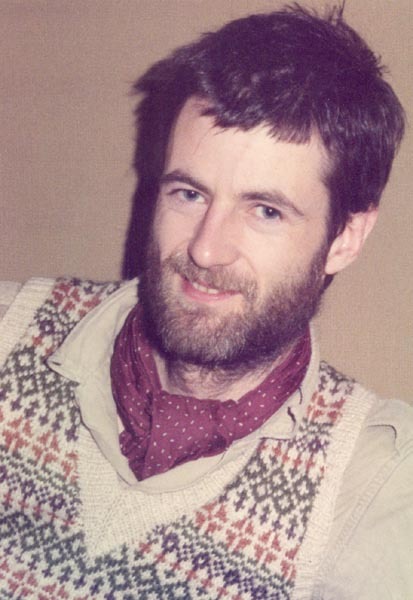 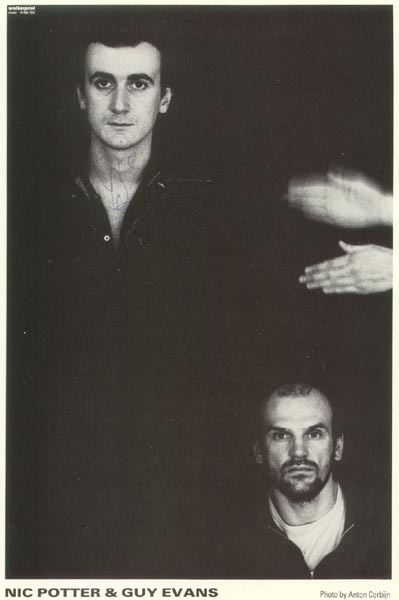 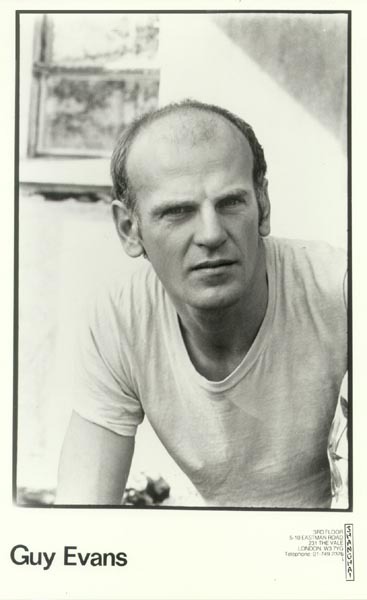 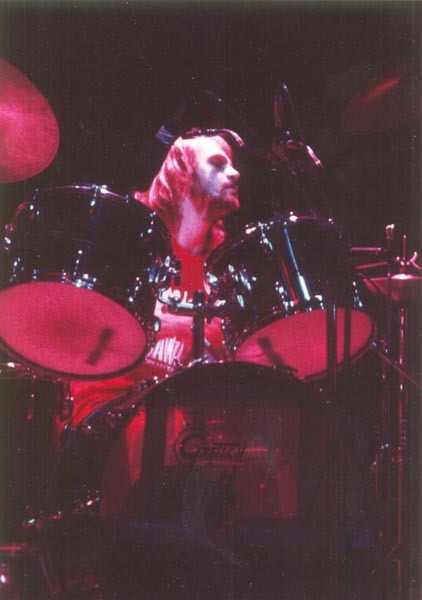 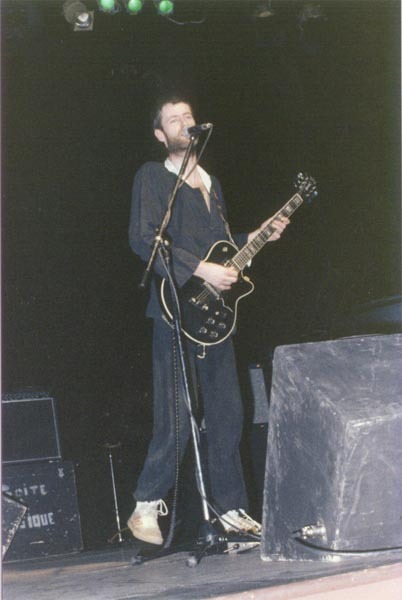 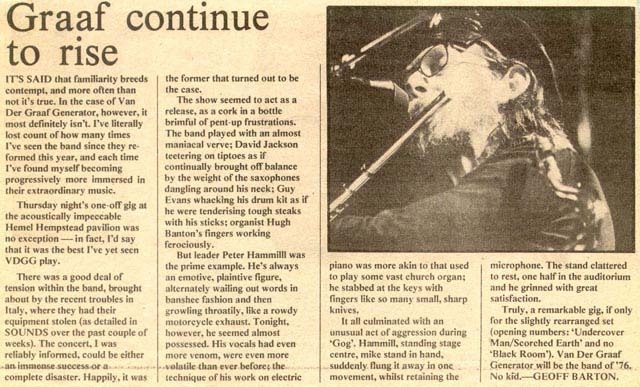 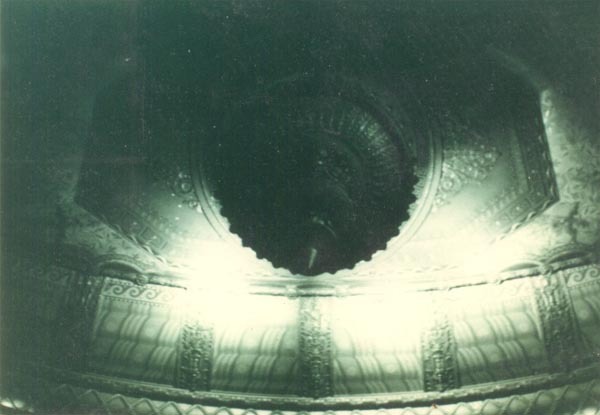 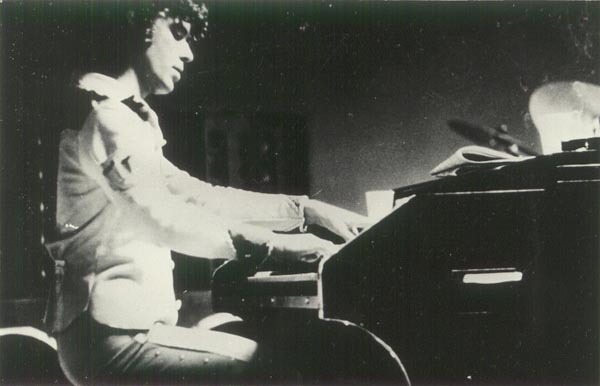 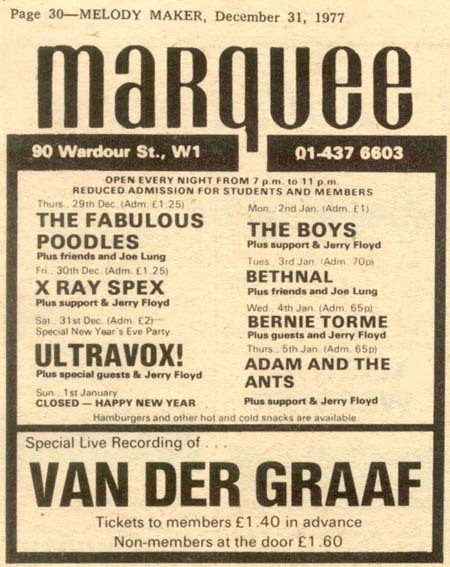 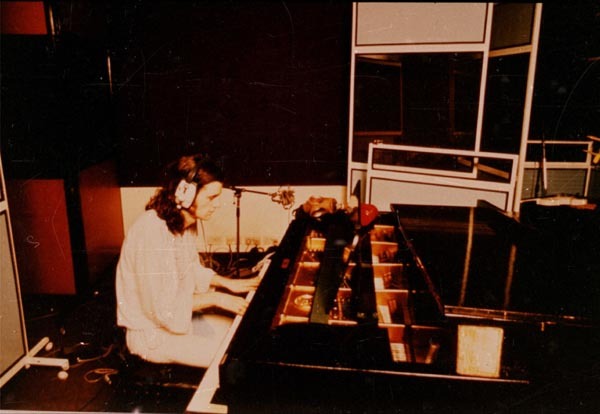 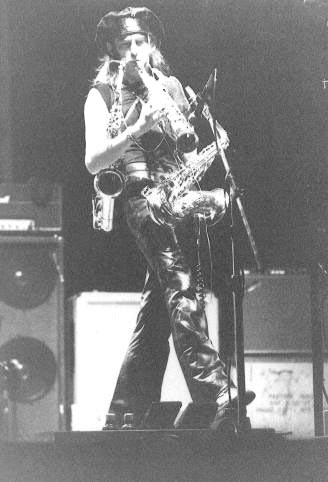 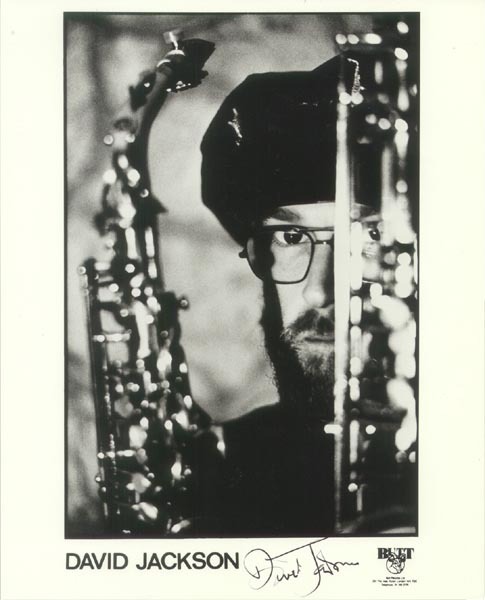 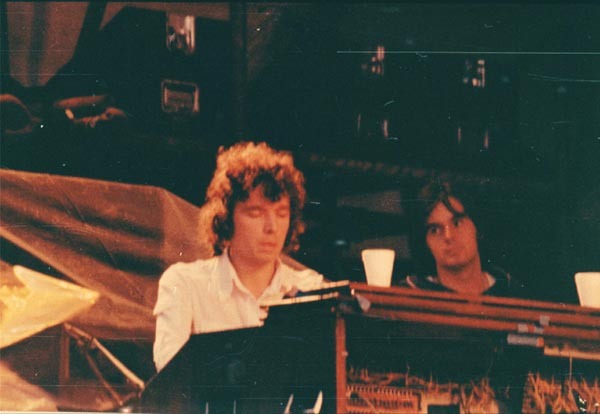 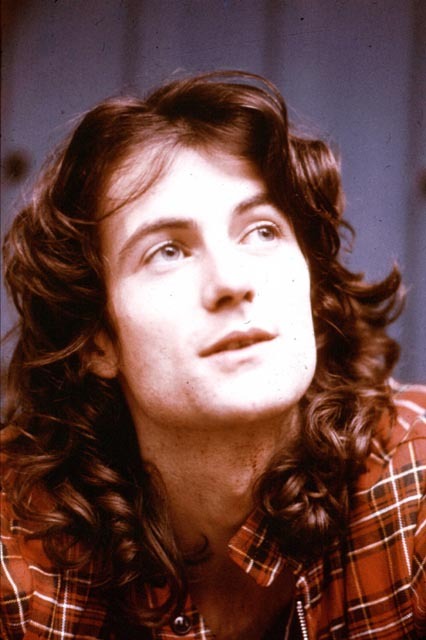 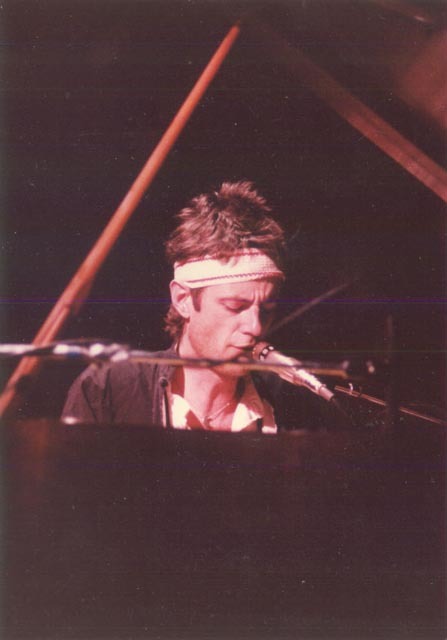 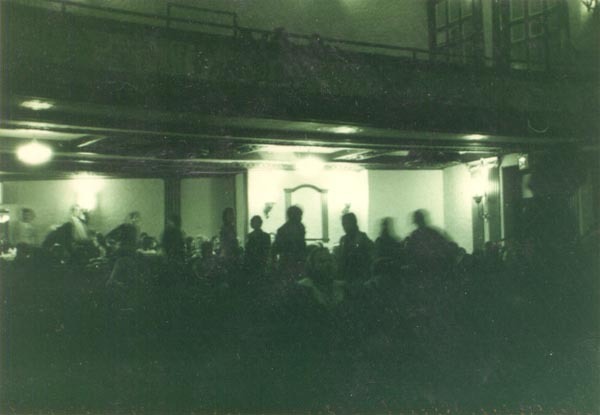 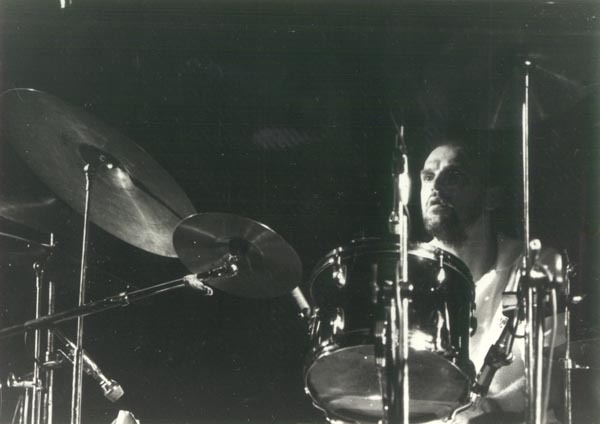 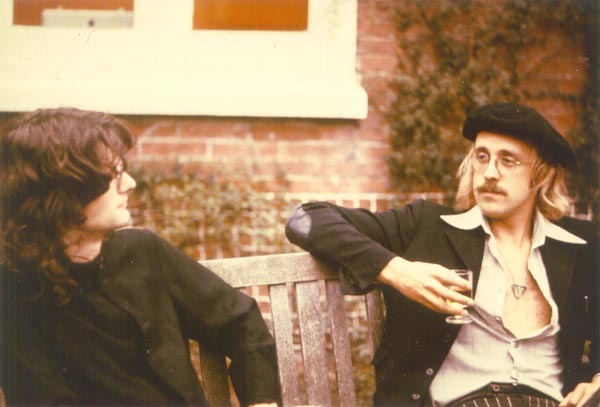 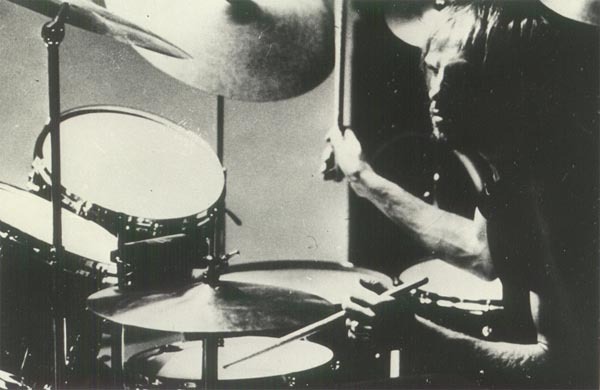 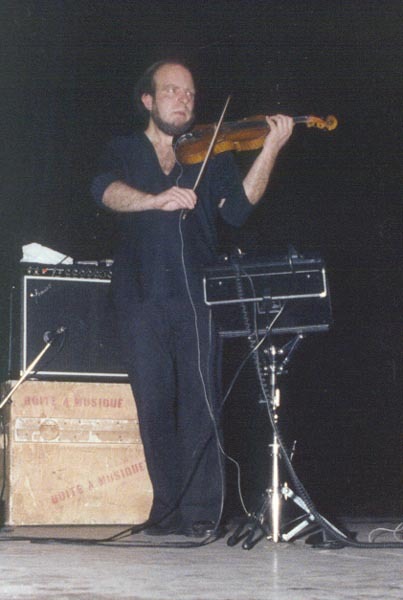 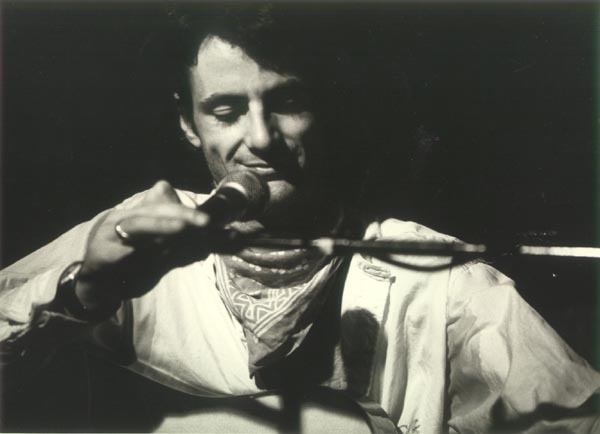 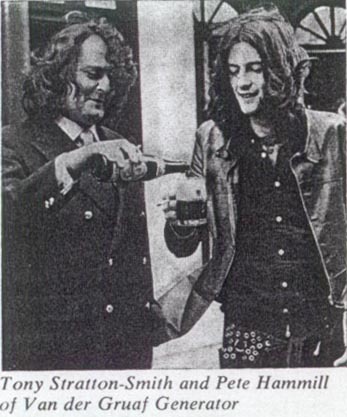 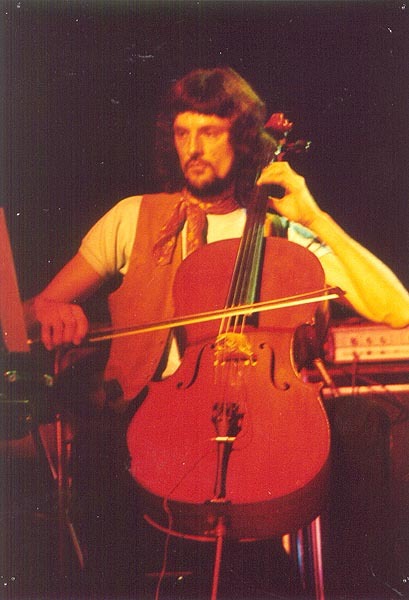 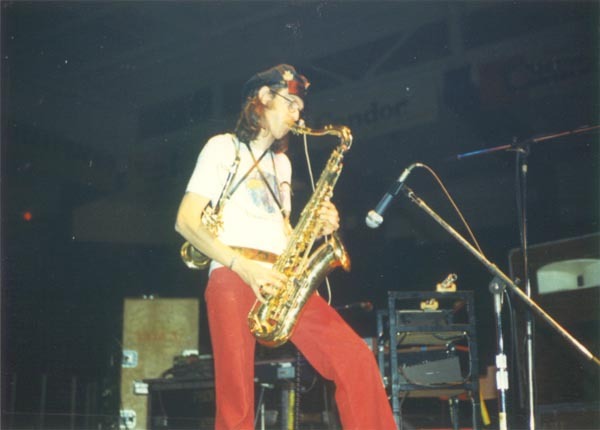 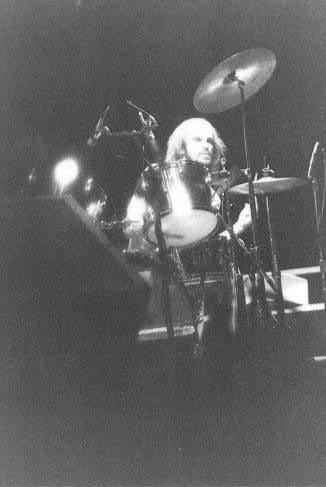 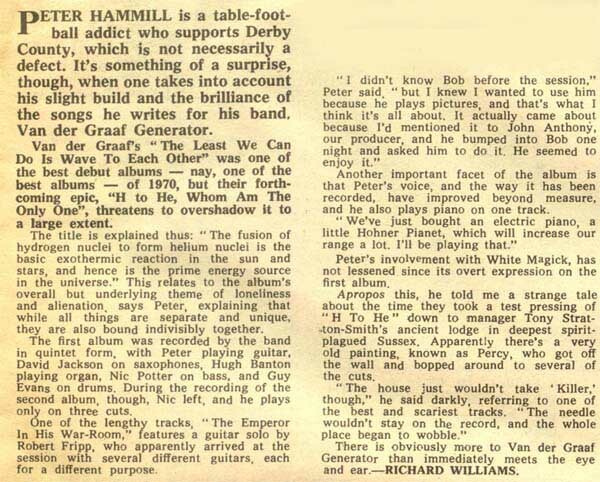 Mike Spindloe, a Canadian and part time mobile disk jockey, who was later to take over the archive, first contacted Dwight in 1984 after seeing Peter Hammill in London at The Bloomsbury Theatre (July 26th and 27th). 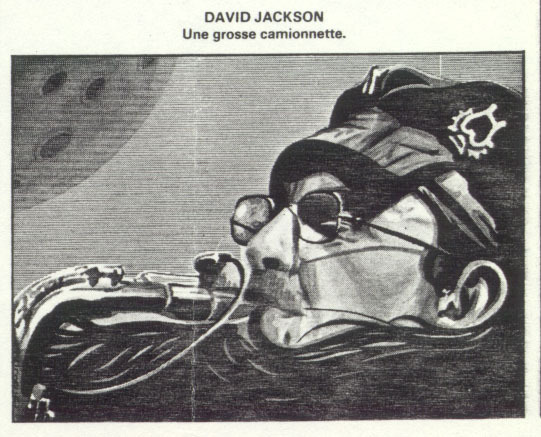 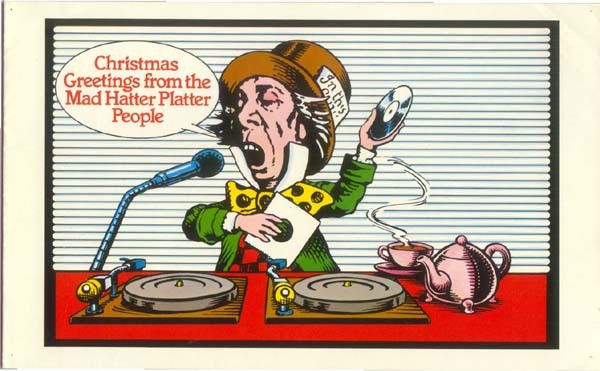 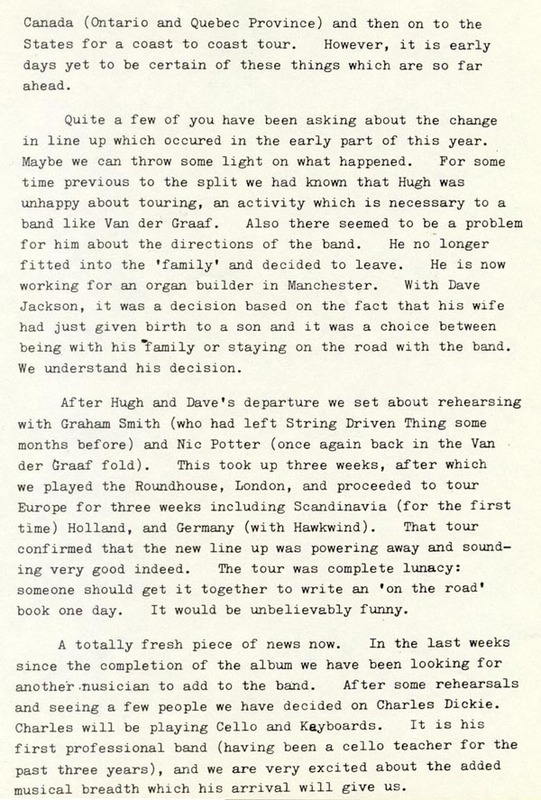 Later in 1986 or 1987 Mike wrote to Dwight to tell him that he was trying to compile some of his favourite moments from his tapes to take with him on his travels as disk jockey. 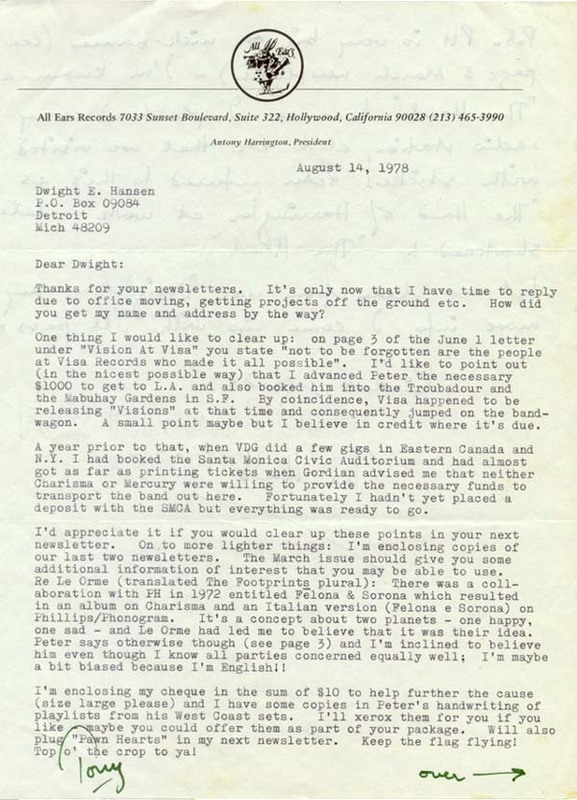 Dwight thought that this was a good idea and proposed sending all the tapes from the archive to work on in order to make a really comprehensive compilation. 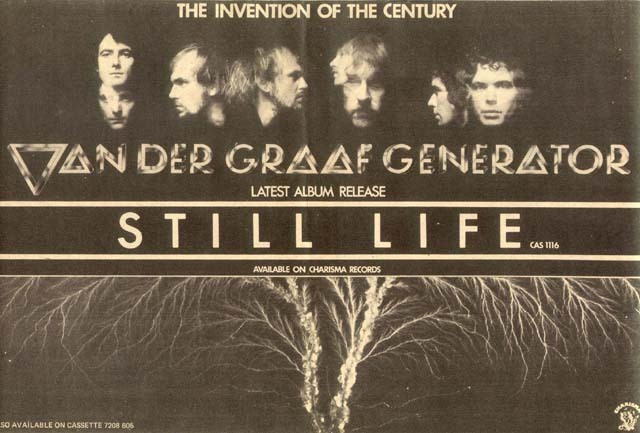 The now-legendary 12 tape set generated from the archive was collectively titled "Fragments Out Of Time" and "In Still Life". 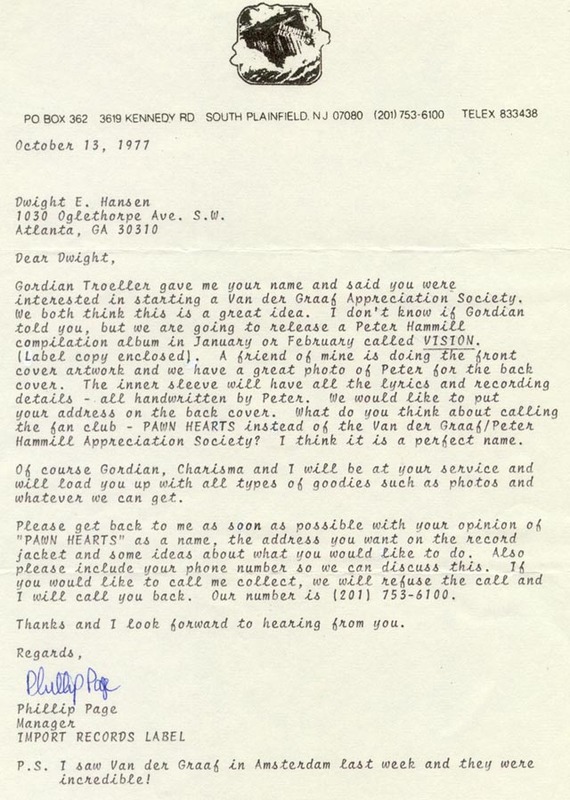 Mike, having spent a good part of the summer of 1988 putting this collection together, then received a phone call from Dwight asking him if he wanted to take over the archive. 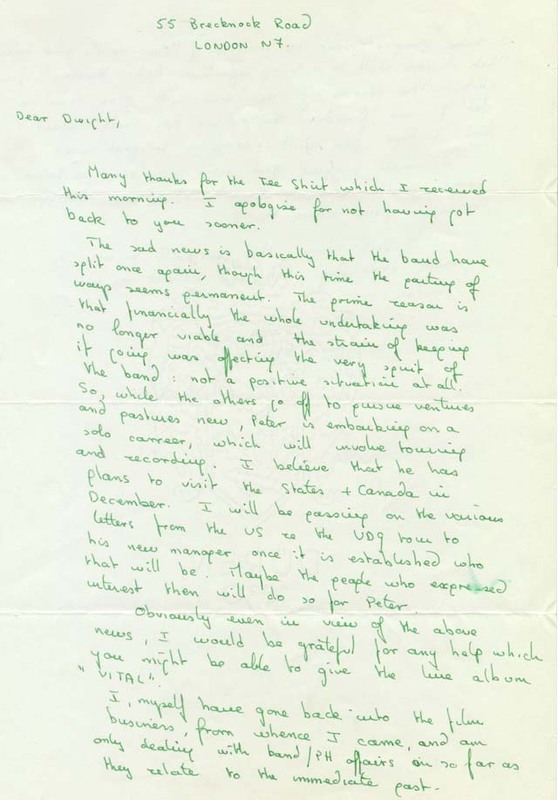 After not too much consideration, he accepted the challenge and the archive moved to Canada. 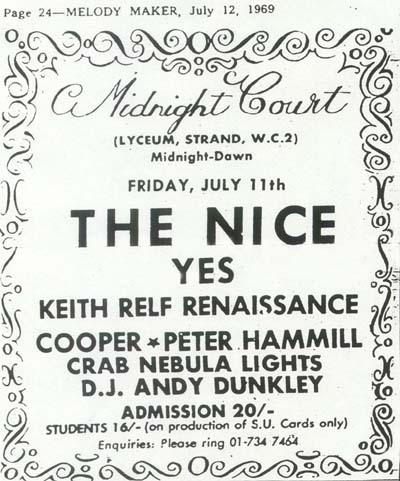 Mike remembers the first few years of his involvement being very exciting. 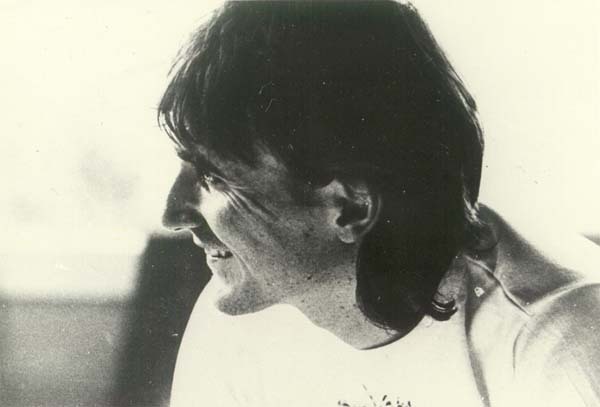 By the early Nineties he had built the subscriber base up to about 400 people. 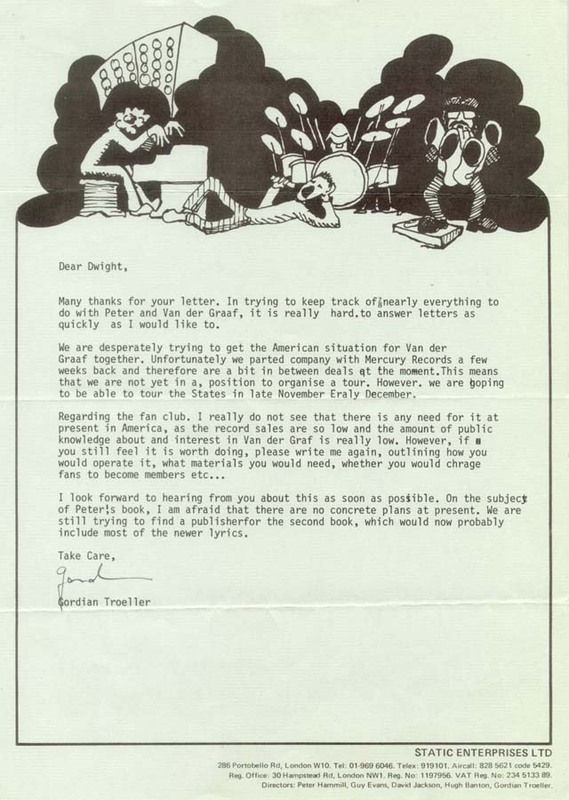 He recalls that hardly a day would pass without some sort of Pawn Hearts related correspondence landing in his mailbox. 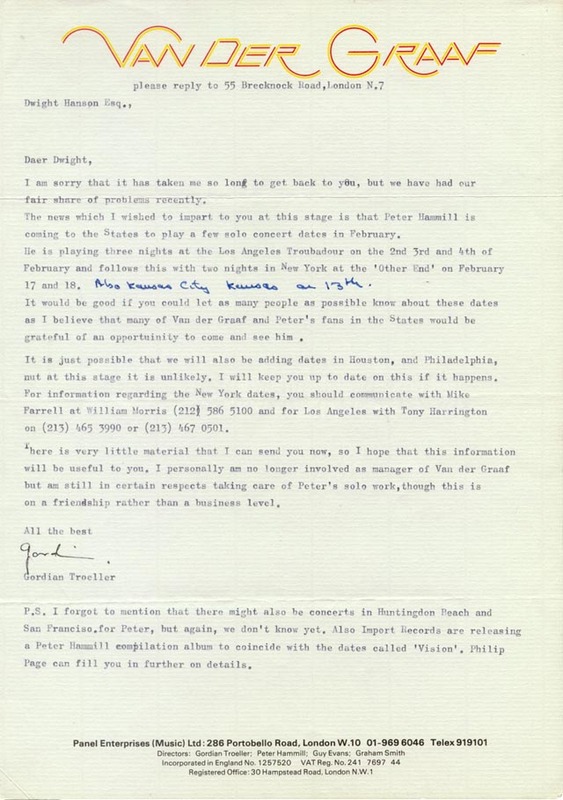 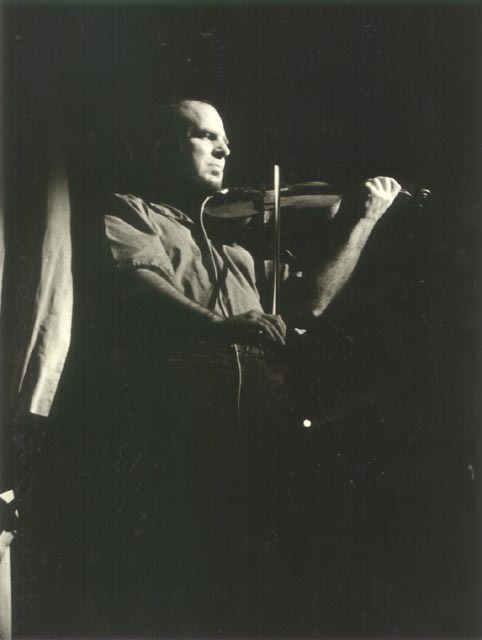 He took to heart the task of collecting the remaining rarities for the archive and keeping the live tapes up to date. 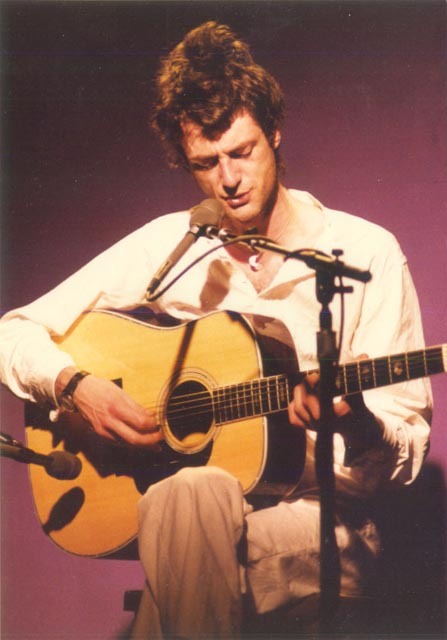 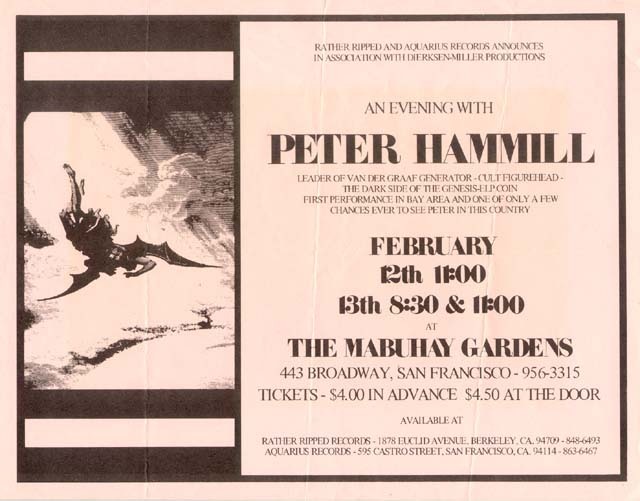 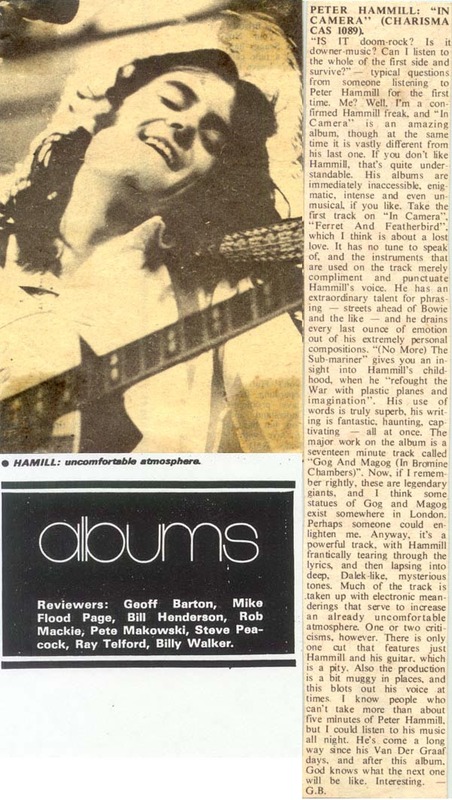 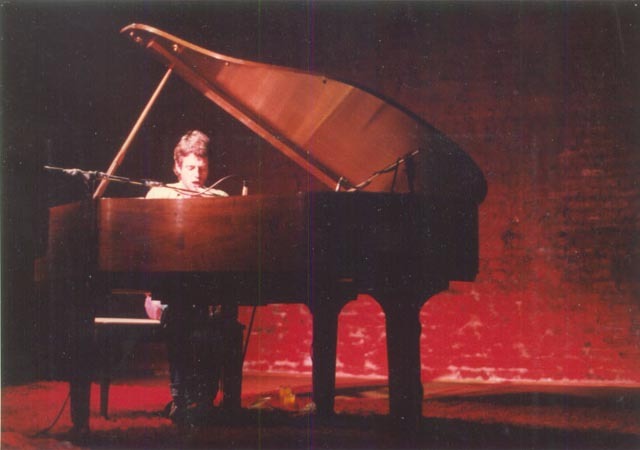 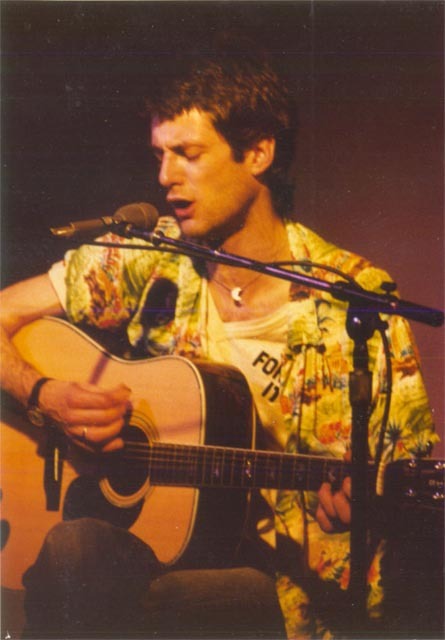 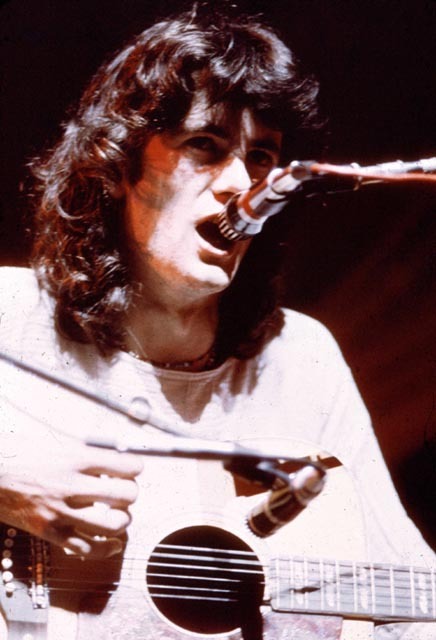 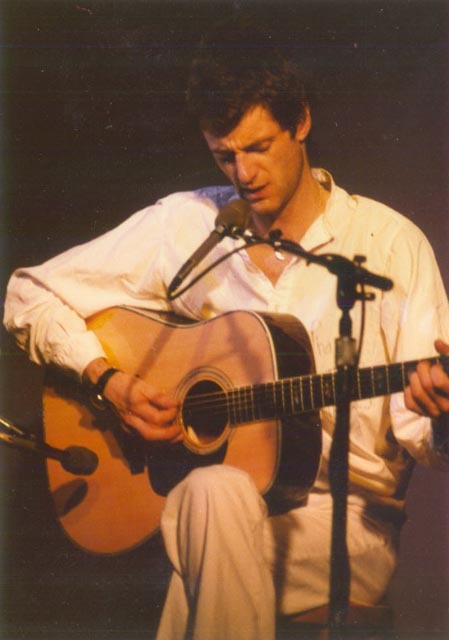 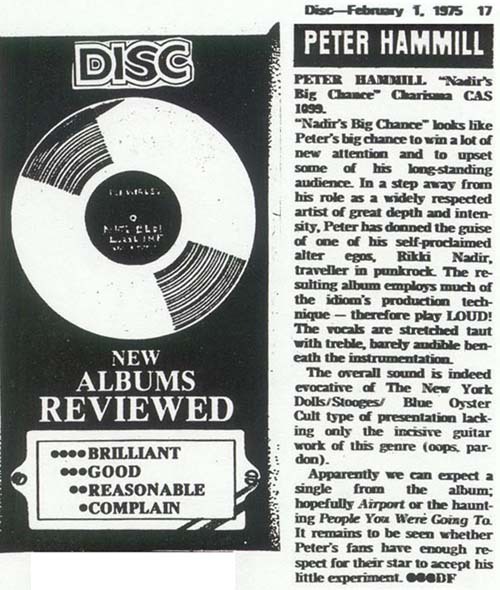 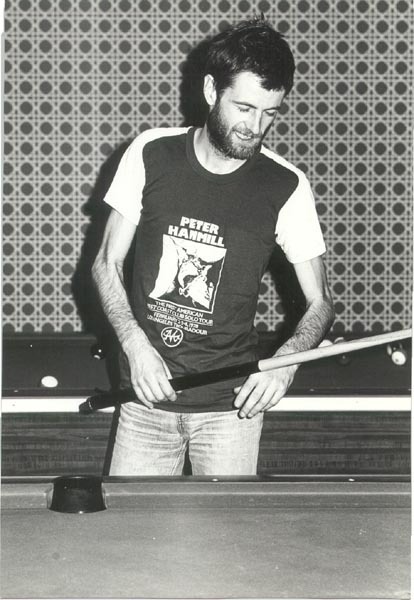 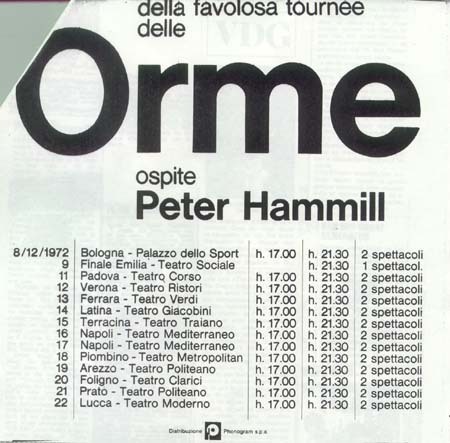 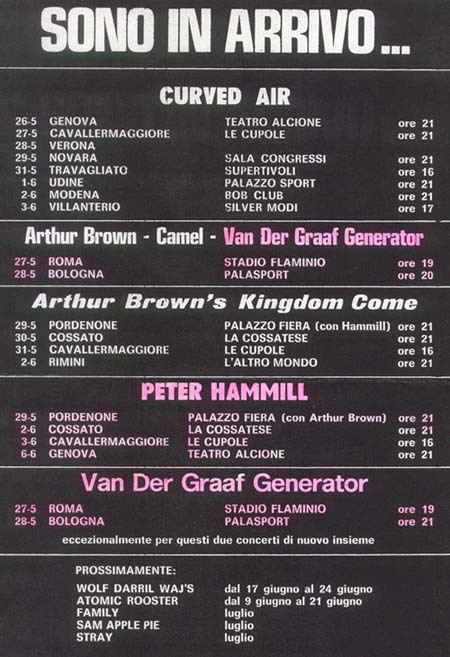 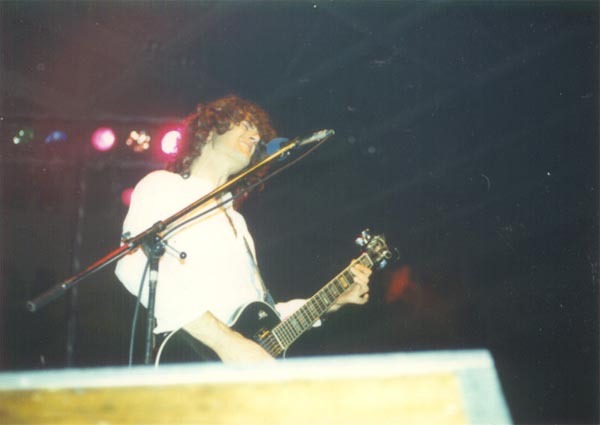 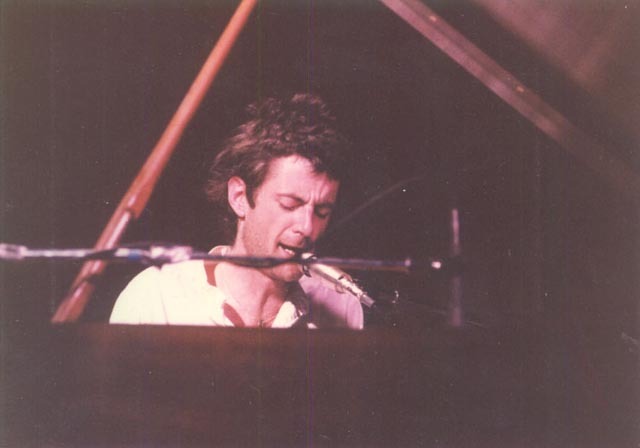 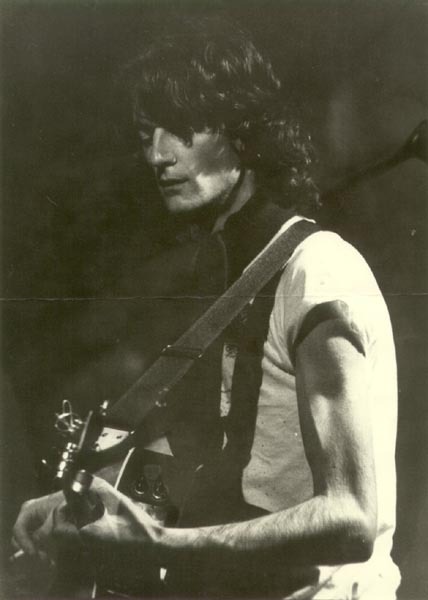 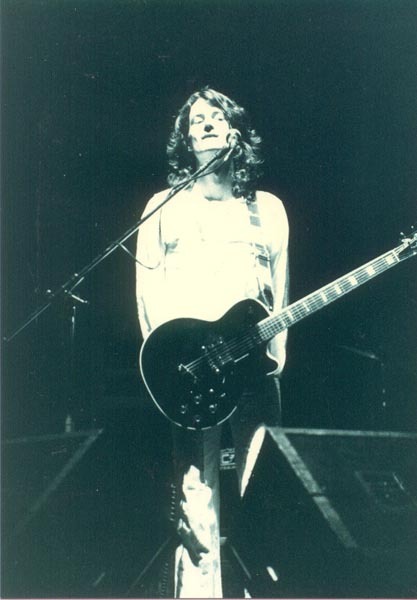 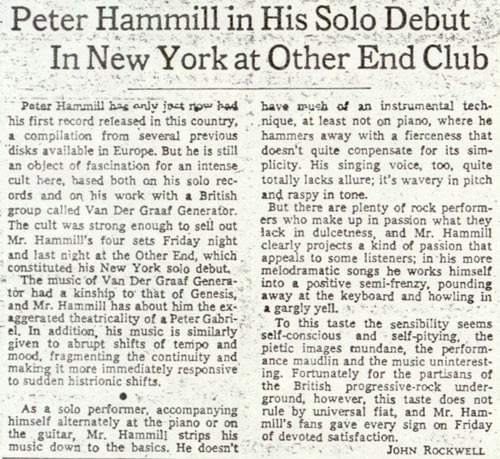 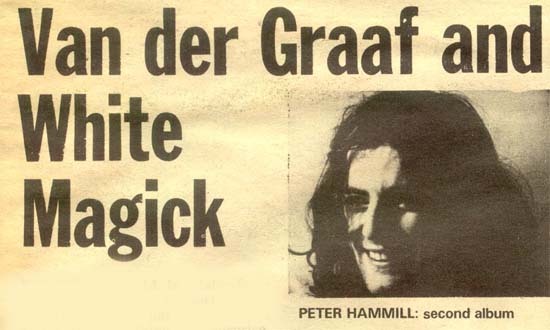 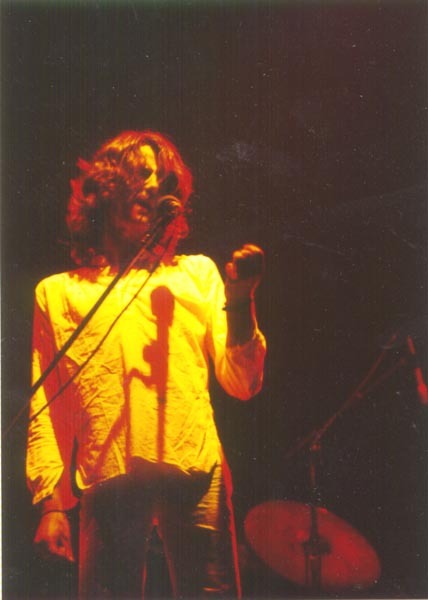 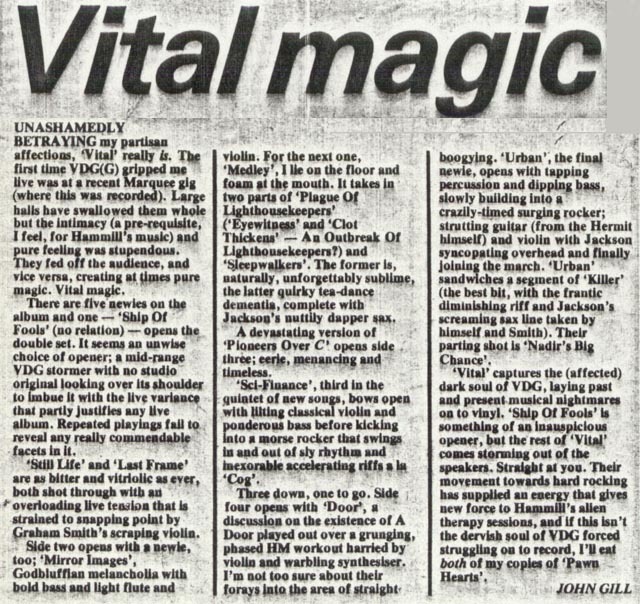 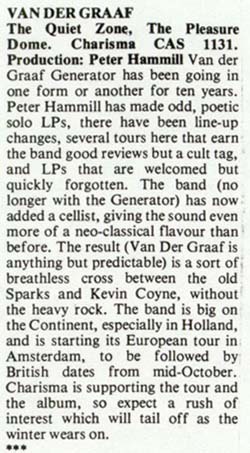 The highlight for Mike was Peter Hammill's 1990 North American tour. 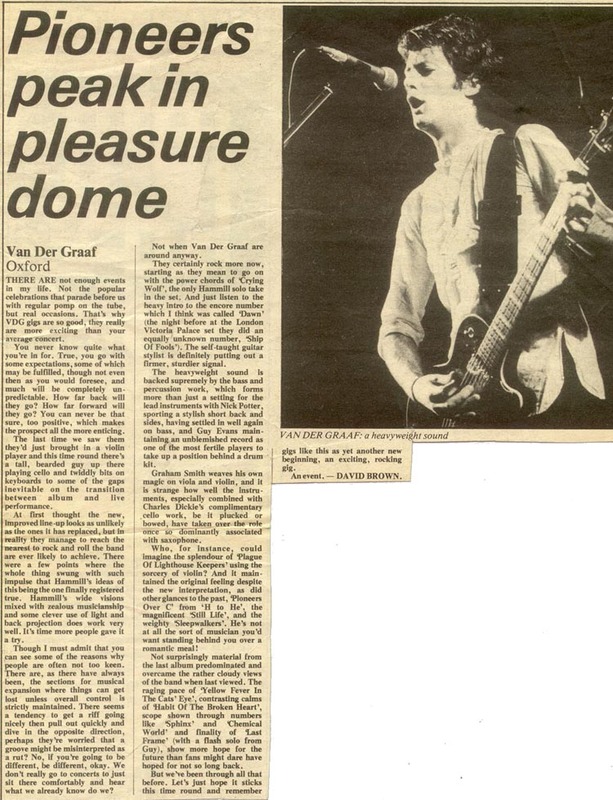 He saw three shows, Toronto, Montreal and Quebec City. 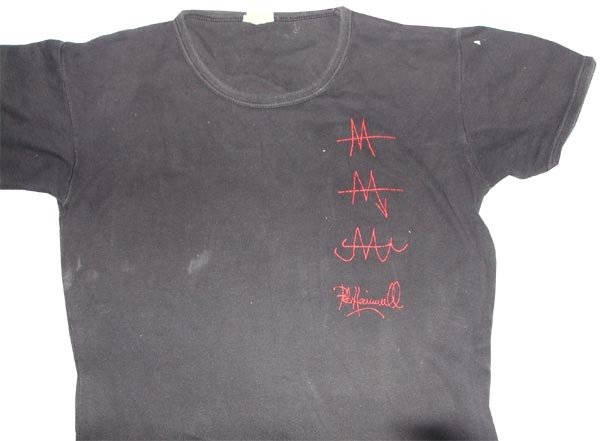 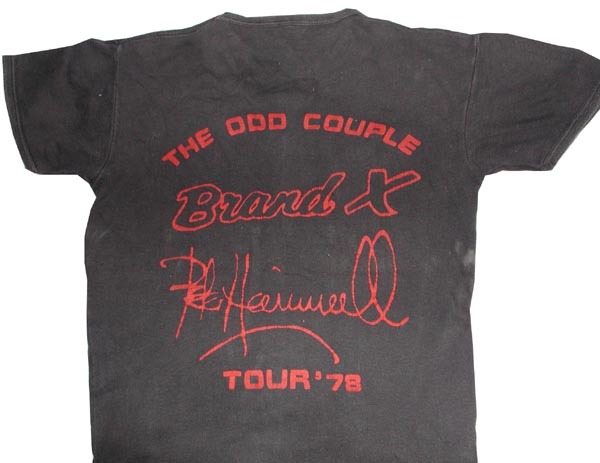 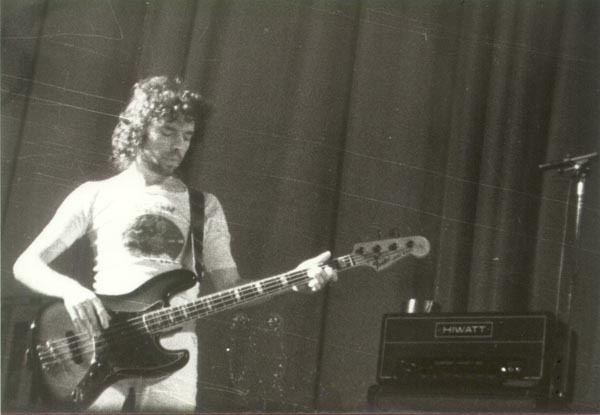 Peter allowed him to make T-shirts and sweatshirts for the tour, and this was the first time that Mike met Peter, Stuart Gordon and Nic Potter. 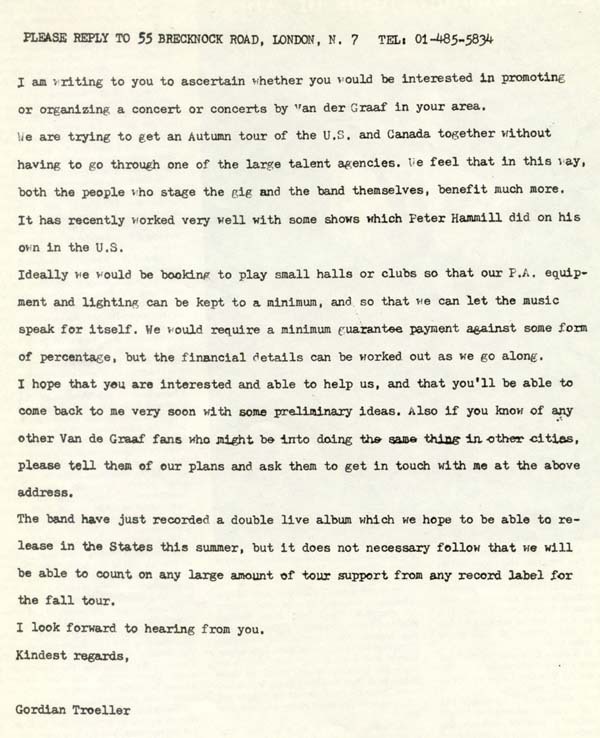 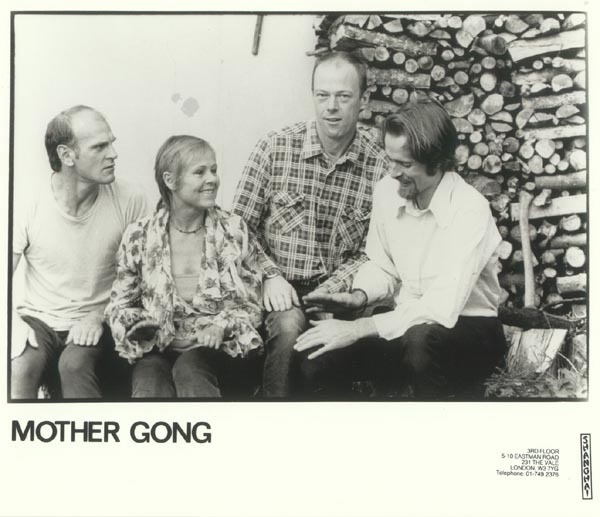 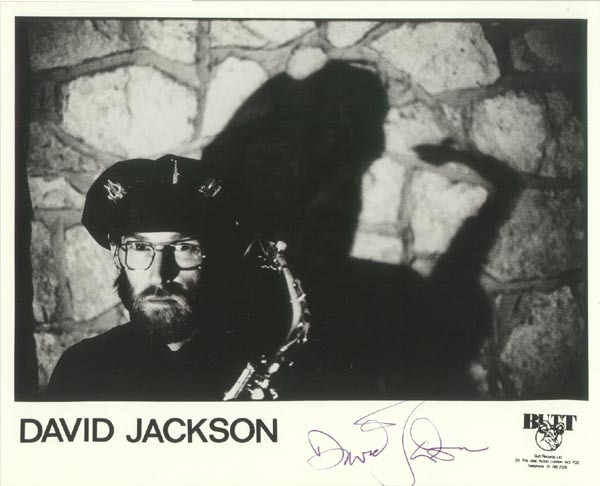 In 1991, shortly after Mike moved from Edmonton to Saskatoon, Dwight requested that the bulk of the albums, CD's and singles be donated to the Archive of Contemporary Music in New York, where they remain. 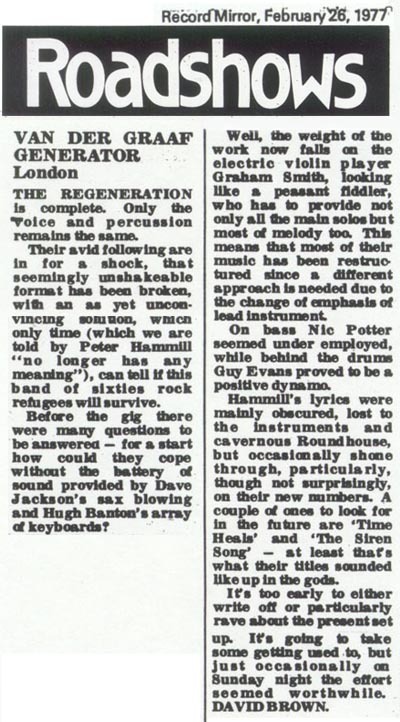 The live tapes were retained by the Pawn Hearts Society. 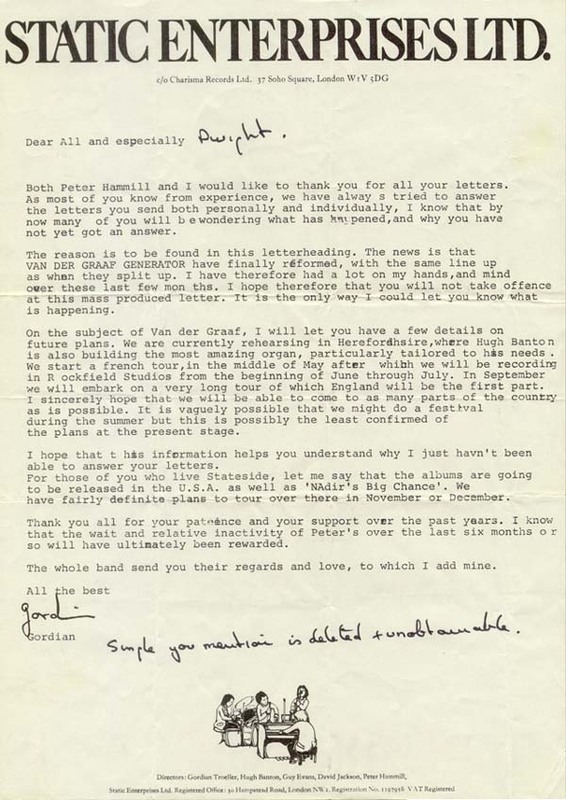 Interest in the archive waned in the Nineties as the internet became more popular and the idea of a central locus for trading became less important. 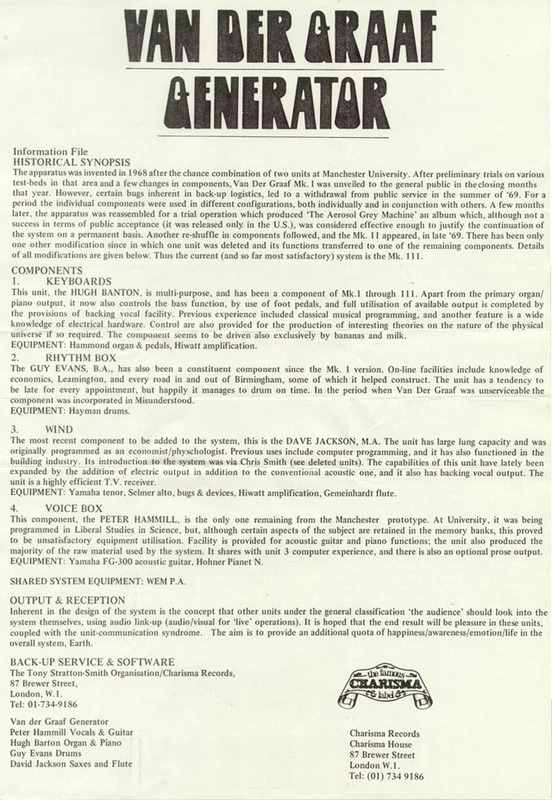 That brings us up to the present and an attempt to display as much of the material on the internet as possible. 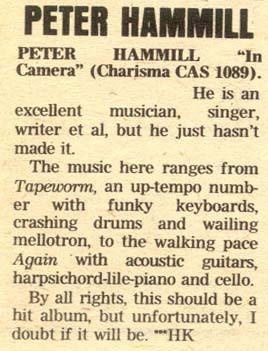 To this end, the paper archive and live tapes are now in England being looked after by Phil Smart, following the sad death of Jamie Fogg. 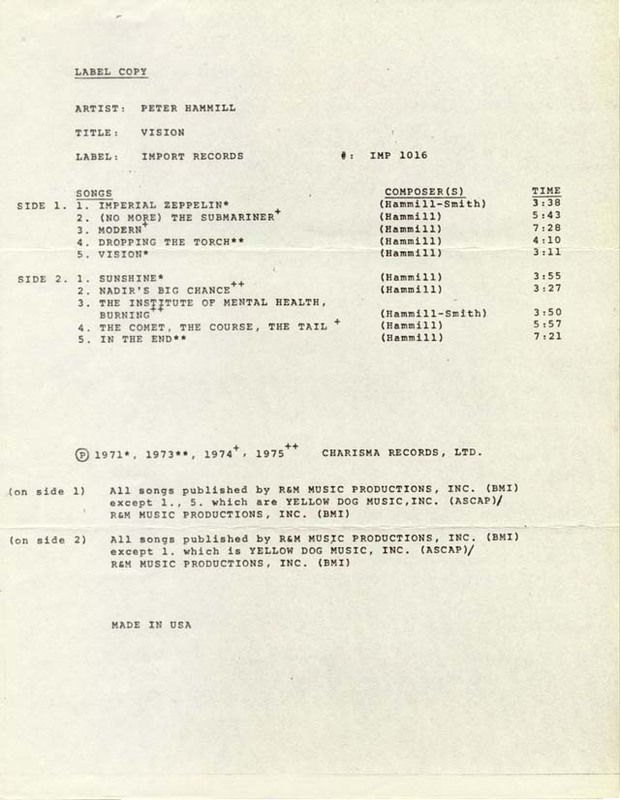 Please note that the material displayed is for your viewing pleasure and not to be reproduced for other purposes without permission from the copyright holder. 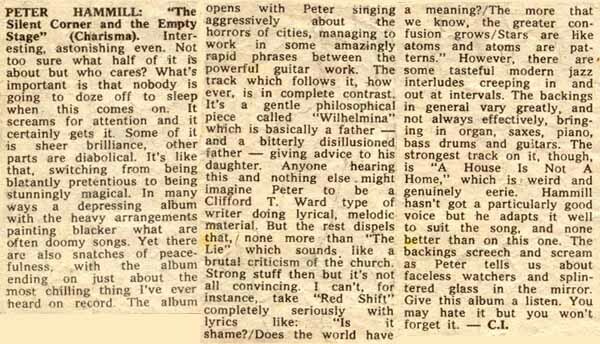 "Story of a Record Company"
PH had something to say about it! 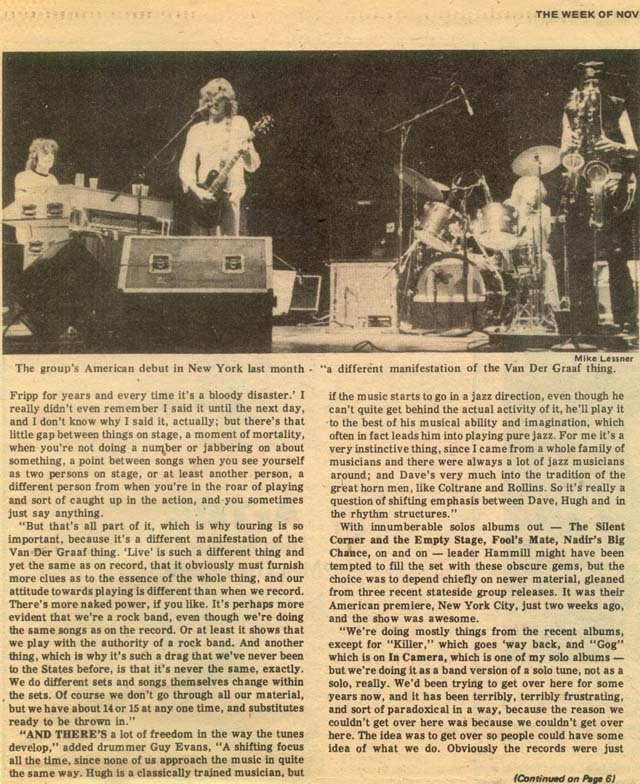 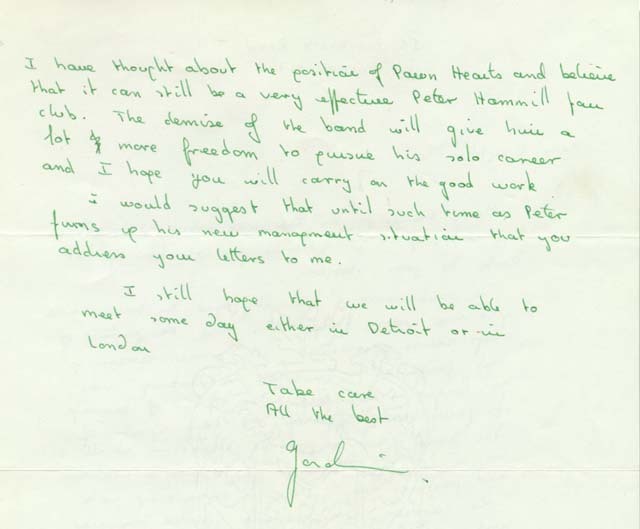 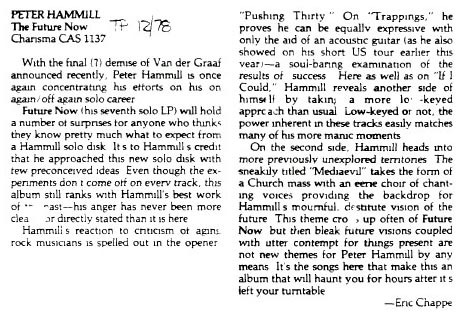 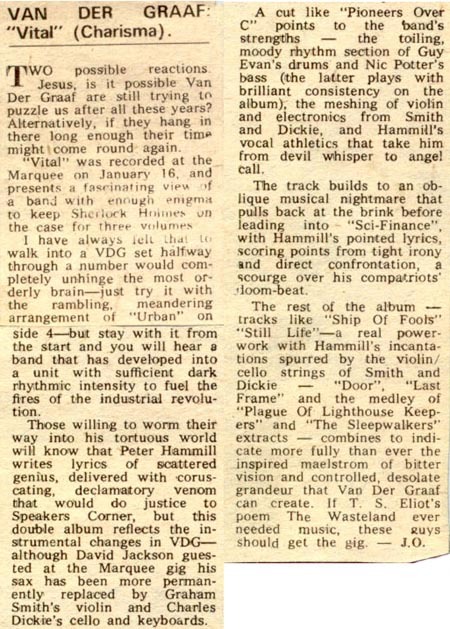 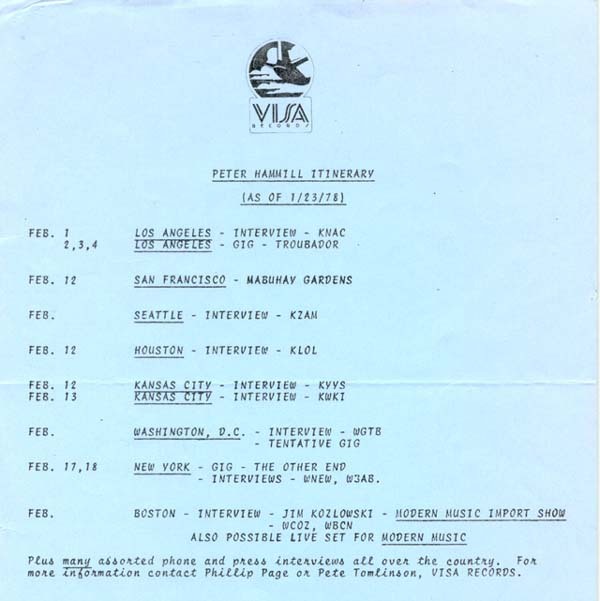 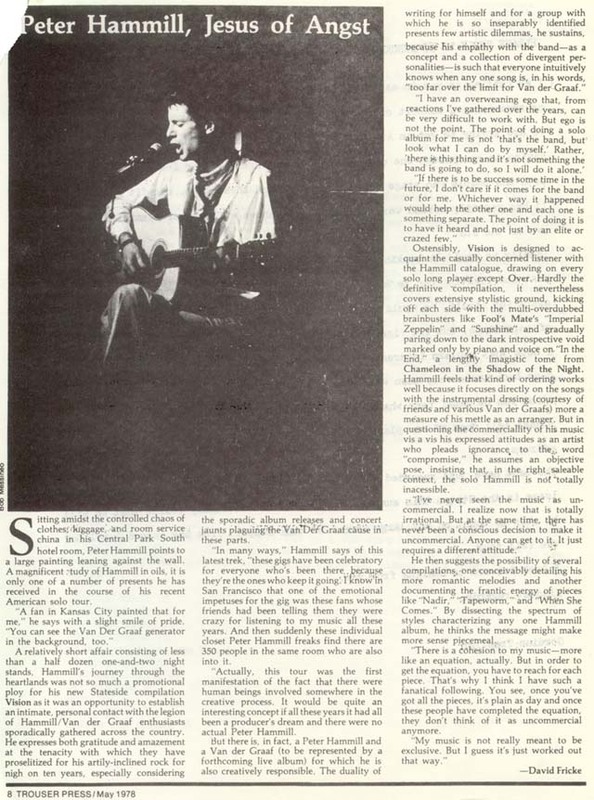 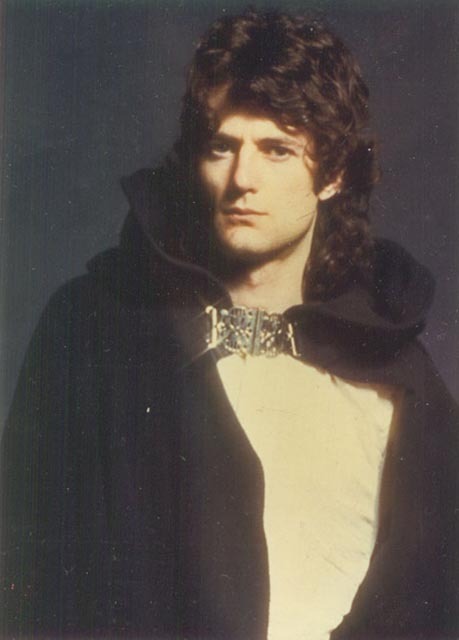 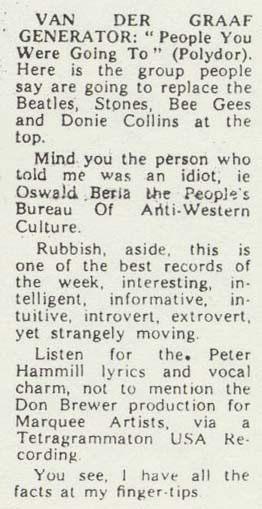 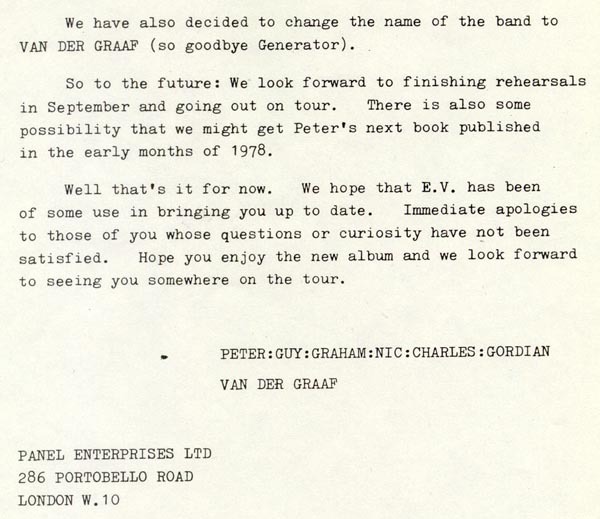 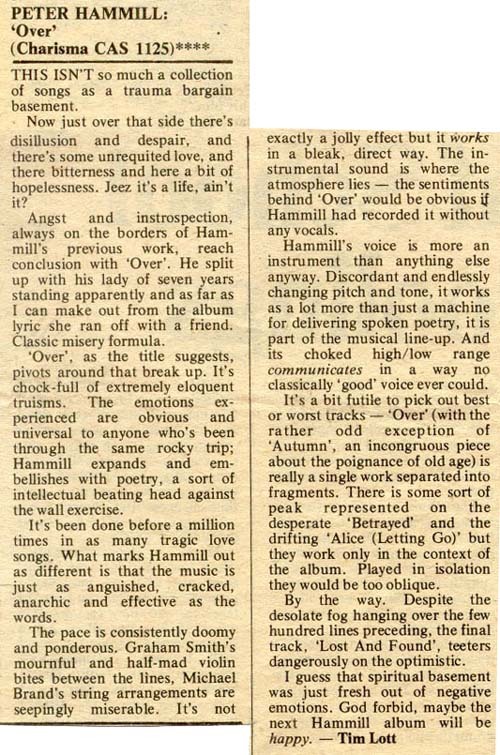 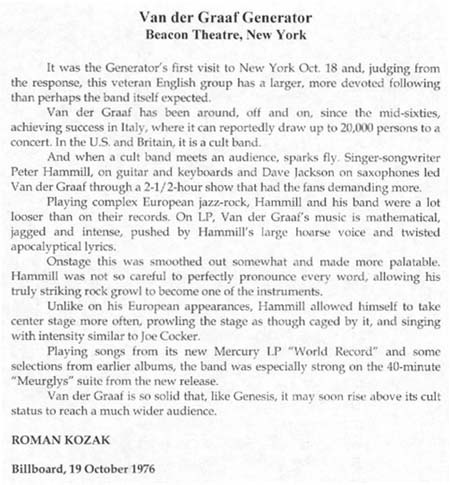 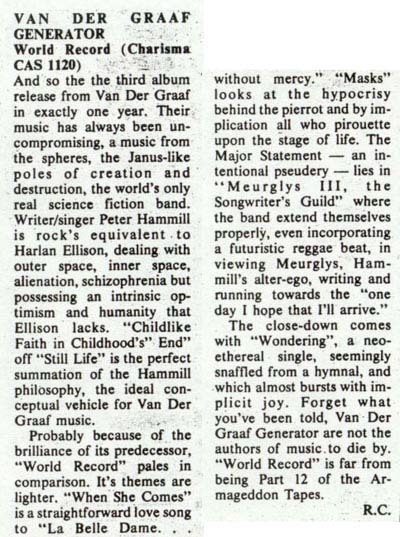 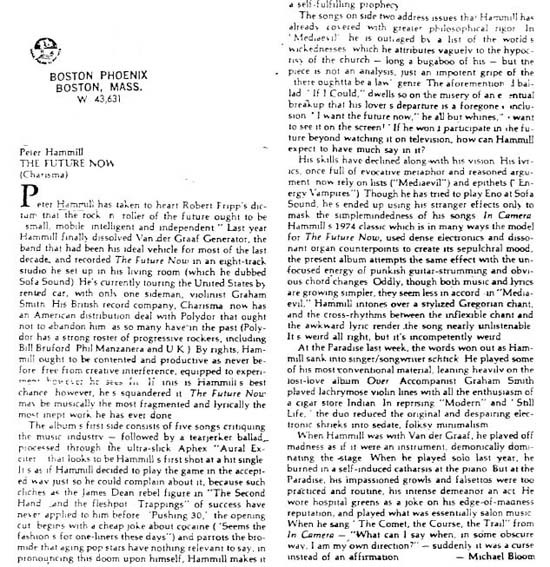 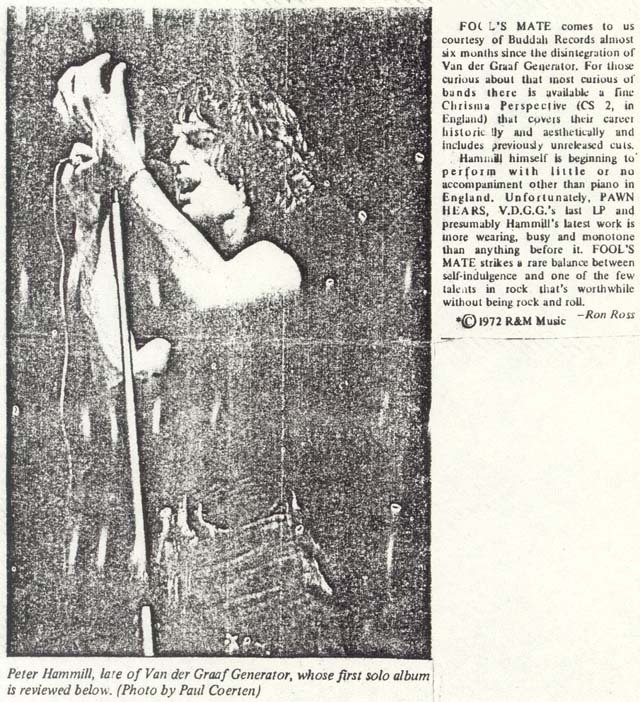 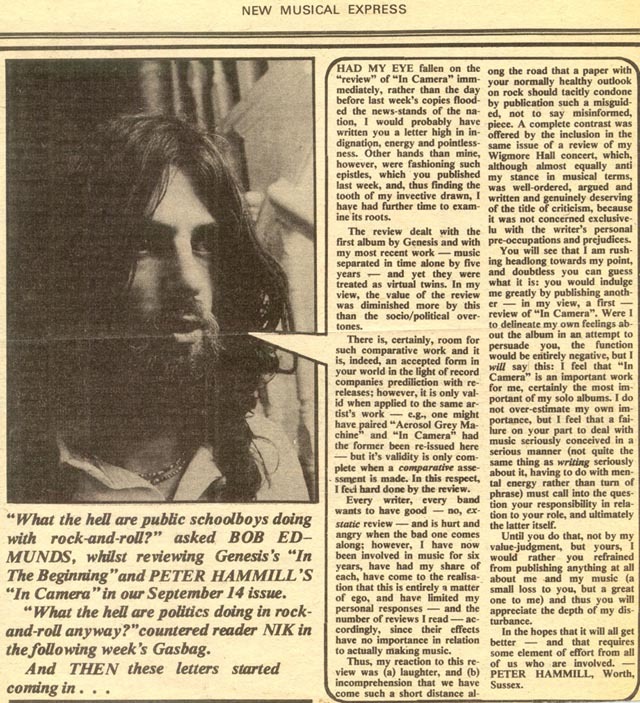 Peter Hammill - "Jesus of Angst"
Page1 Page2 A couple of letters from Gordian Troeller concerning the Autumn tour of the USA that never was. 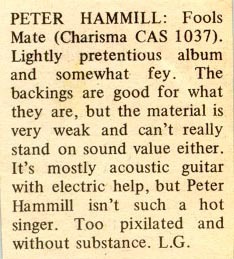 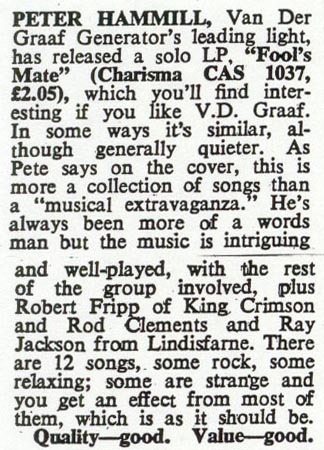 Peter Hammill's first album after split.